– by taxi: the journey will take 15mins and it will cost around 30CAD. During the first days you will be affected by a problem that affects millions of travelers everyday: the jet lag! The secret however is to take advantage of it, especially during the first days, where you will be able to wake up very early and have more time to enjoy the city! Try to be awake at least till 20:00 or 21:00 and wake up at 6:30, you will have a good sleep and in the morning you will have enough time for a delicious Canadian breakfast. Breakfast over there is delicious: you can taste pancakes with maple syrup and other specialties of the country. Breakfast can easily take you 30mins or more, depending on what they will serve you, and it will never be a deception. After a good sleep and a delicious breakfast you have completely charged your batteries and you’re ready to go and explore the city! Something to remember about Canada (and especially Québec city) is that temperature might vary a lot during the day, depending on the cold wind, so better to dress in a proper way and wear comfortable and warm dress and shoes. 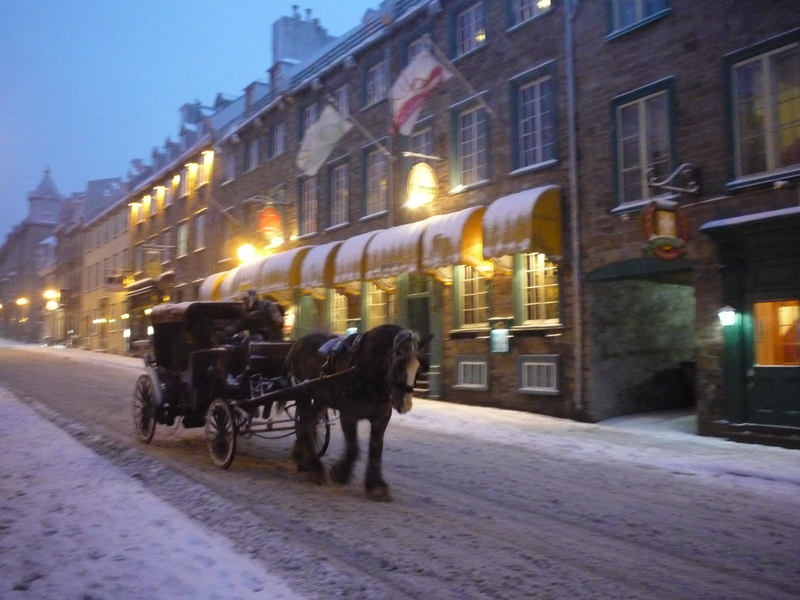 Québec city is very charming and romantic, somehow you will feel like you are in a small town in France. You can feel the French influence everywhere: in the small streets with pavé, in the small and ancient buildings, in the architecture, in the food and of course in the language (Québec city is strictly French-speaking, all the signs are in French and people speak mainly French). It looks like someone took a city from Europe and moved it to Canada (especially after having visited the other Canadian cities, I really realized the big difference between those ones and Québec city). It is a nice place to stay in winter and in summer time, especially for a romantic trip. The city center is very small, therefore you don’t need to take any public transportation to move. 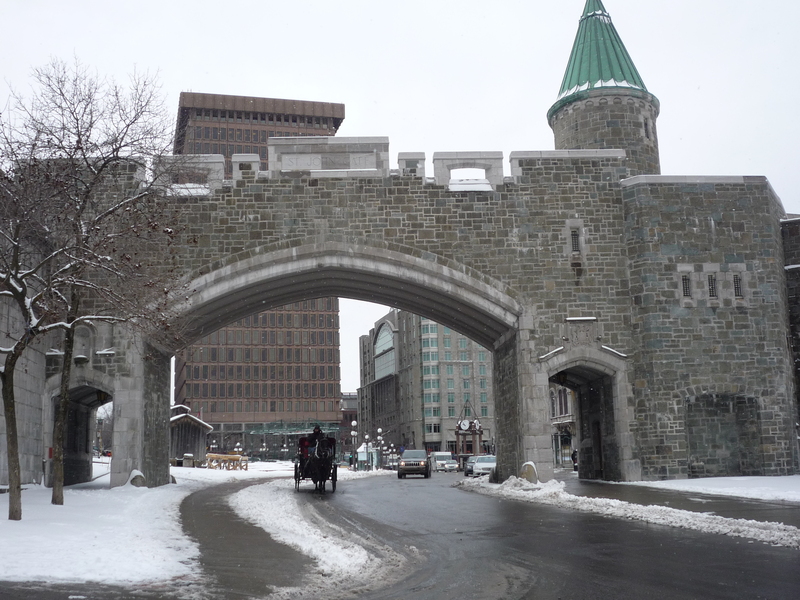 The trip in Québec city can start from the Citadel. Have a tour in this nice spot of the city and visit the Royal Museum with his historical masterpieces. The view from the Citadel is simply breathless, with a good weather you will have a complete view of the entire city. The admission fee is 10CAD. Take Avenue D’Auteil now and you will find Porte St Louis on your left, one of the several arcs that mark the entrance to the old city. Cross Porte St Louis, turn left and after a while you will arrive at Place de l’Assemblée Nationale, where the Parliament is located. Keep on going through Avenue Mercier and you will cross a very picturesque street of Québec: Rue St Jean. 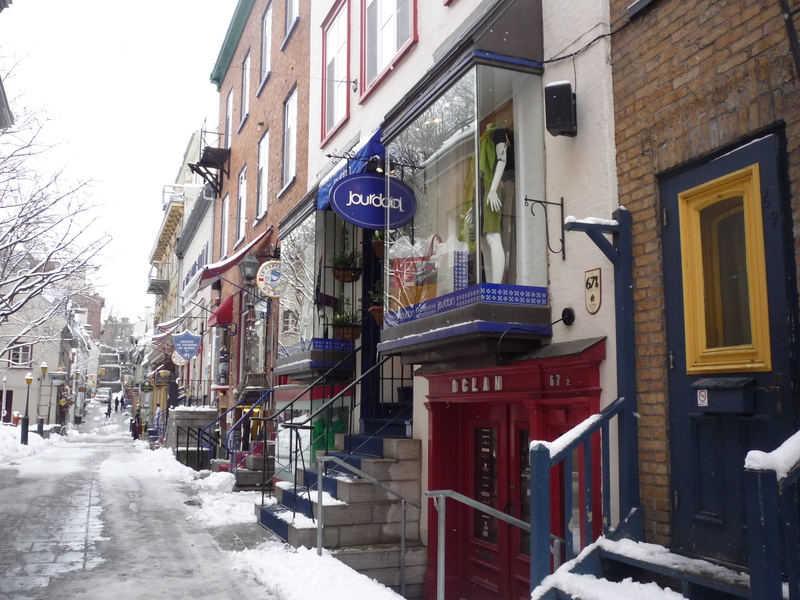 Rue St Jean is the heart of Québec life: this street is plenty of special restaurants, cafes, stores. 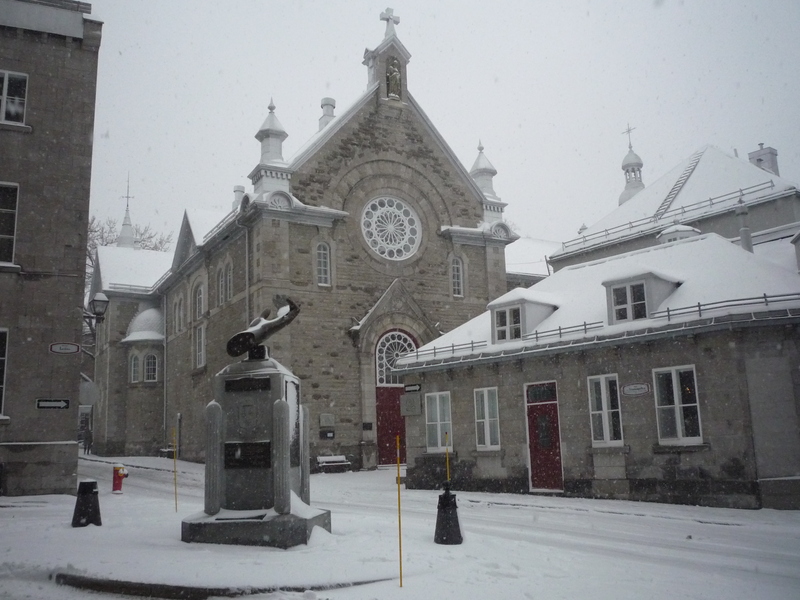 Walk on the left side till the Church of St Jean Baptiste and enjoy the view of all the special stores. This is a nice place to have lunch or just taste the several delicacies cooked with maple syrup. 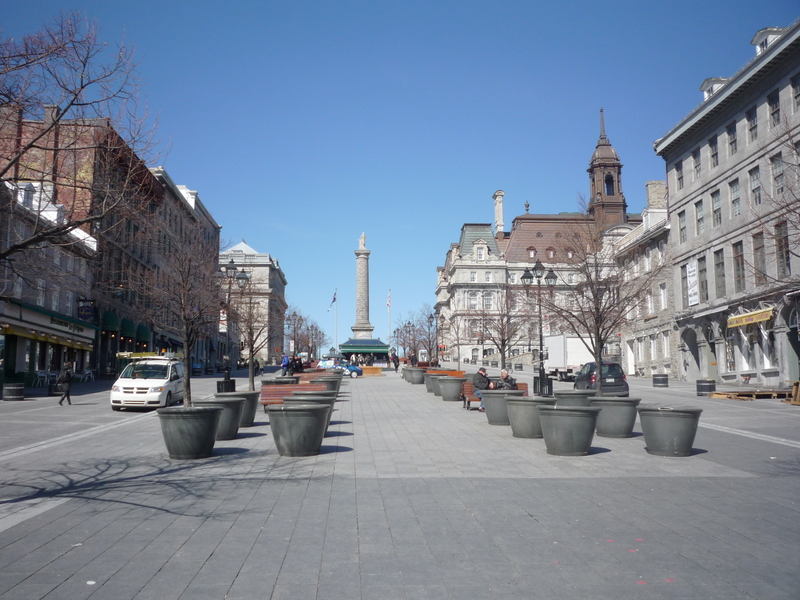 Taking Rue St Jean on the other side, you will arrive in one of the main squares in Québec city: Place d’Youville. This is a small square surrounded by theaters, concert halls, restaurants and stores. Cross Porte St Jean and keep on walking through Rue St Jean, until the street will become Rue de la Fabrique. After few minutes you will find the Hotel de Ville (Town Hall) on your right. This is very nice building, with a strong French influence in the architecture. 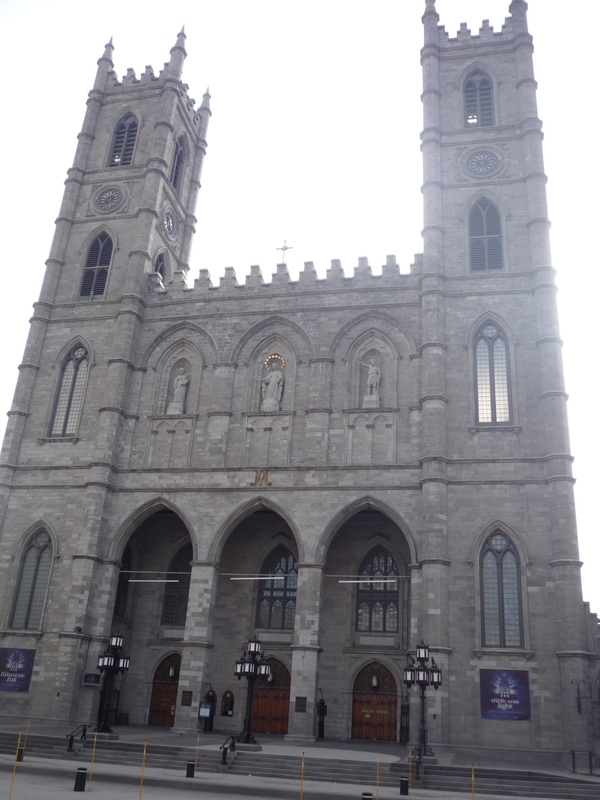 After the Hotel de Ville you will arrive at Notre Dame Cathedral, the oldest cathedral in North America. Inside is a real marvel : baldaquin, canopy, paintings, glasses. 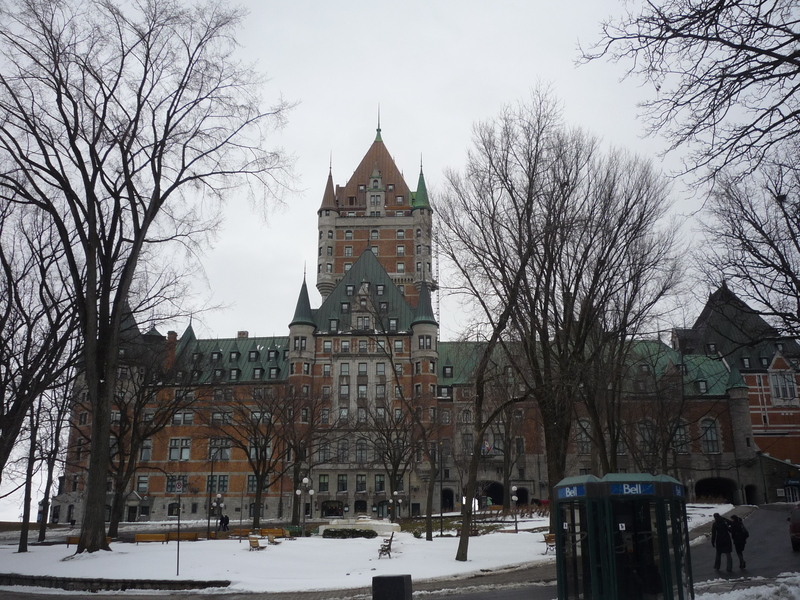 From the cathedral, take rue du Trésor and rue St Louis and you will arrive at the main symbol of the city: the Chateau Frontenac. This is nowadays a luxury hotel with a very impressive structure, a huge castle located just in front of the river. Lucky who can afford to pay a room over there! Just in front of Chateau Frontenac the waterfront starts: a nice walk where you can enjoy the riverside. From the castle take the street downhill (Cote de la Montagne) and you will arrive in the oldest part of the city, a corner plenty of charm. Take rue du Petit-Champlain and enjoy all the typical and ancient stores and restaurants, have a good lunch over there, take a nice rest. And do not miss the great fresco located at the end of this street. After having seen the fresco, take the street in front of it (rue des Traversiers) and keep on going through Marché Champlain, then you will arrive at Place de Paris, a very nice spot of the city. A drink there under the sun can be very enjoyable. From Place de Paris take rue du Marché Finlay and you will arrive at the core of the old town: Place Royale. The place was called like this in honor of Louis XIV and his statue is right in the middle of the square. In the past, this place was the center of the city commercial activities. 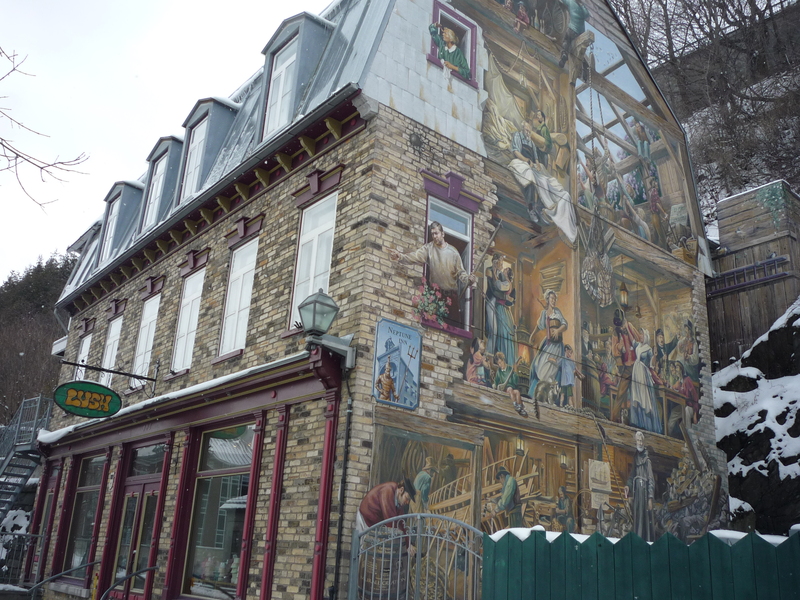 On the side of the square you can admire a fantastic fresco, the Mural of Quebecers, depicting 400 years of Québec city history. 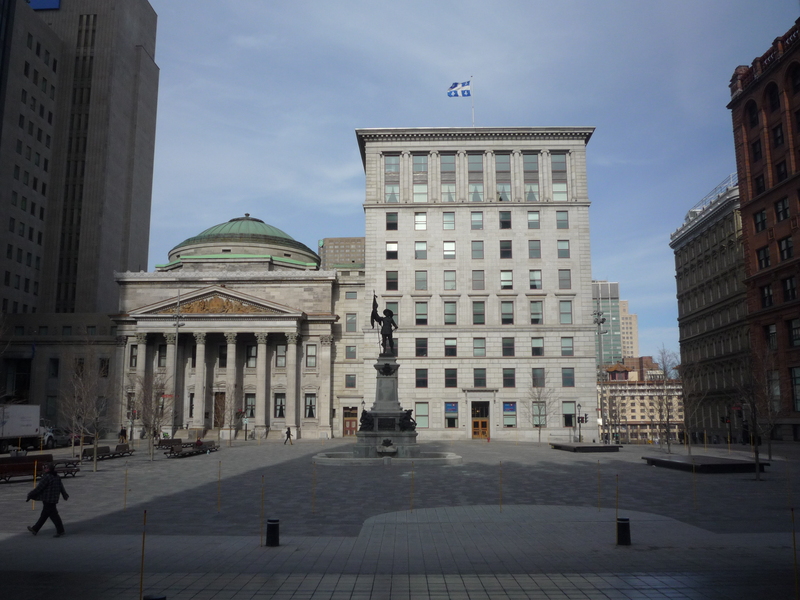 From the Mural of Quebecker, take rue St Pierre and you will get to Place de la FAO, a place to commemorate the 50th anniversary of FAO, founded in Québec city in 1945. From Place de la FAO keep on walking through Rue St Paul and after 5mins you will arrive in the Old Port district, more exactly at the Port Old Market. This is a small structure that faces the port and where artisans and farmers sell their products. 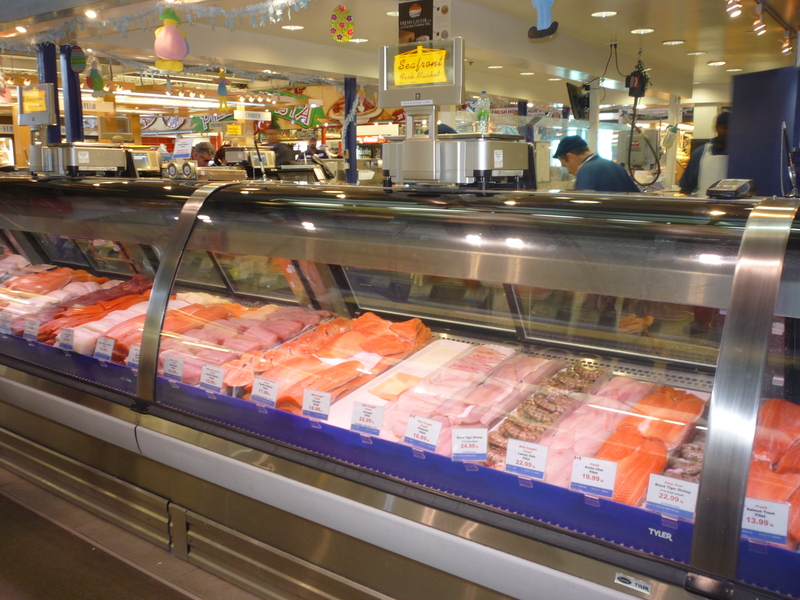 The ideal place for a snack with cheese, or maple syrup products, or fish. After a tasty stop at the Old Market keep on walking through rue St Paul and you will get to Gare du Palais, the main train station, which consist into two nice buildings made in fake Renaissance style. This is also the place where you will take your train the day after to go to Montréal. On your second day in Canada, take advantage of the jet lag, have an early wake up and leave for Montréal. You can move from a city to another in different ways: by car, by plane, by bus or by train. Since I was traveling alone, I decided to take the train. Trains in Canada are generally good and comfortable, not very fast but with few stops and generally on time, and if you book in advance you can have interesting prices. There are several trains circulating between the main cities; in order to save time I caught the one leaving at 7:45 and arriving in Montréal at 10:50. 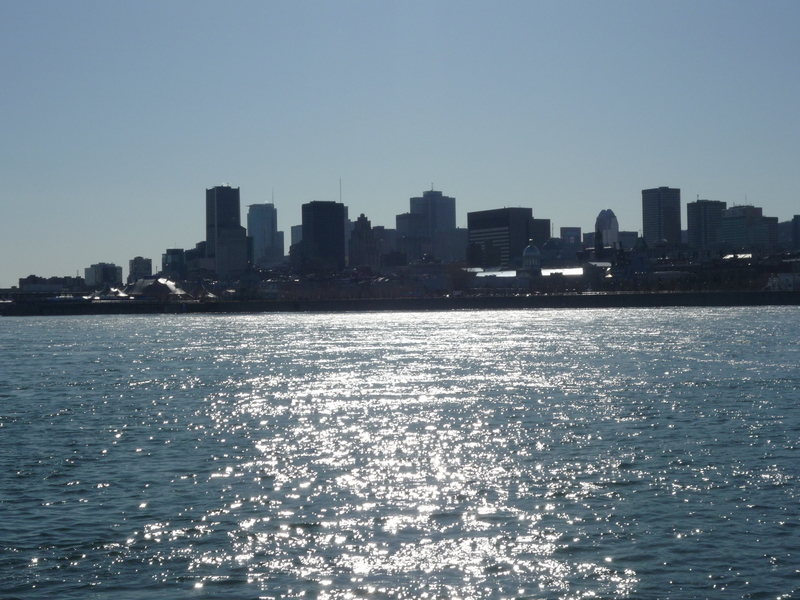 And here we are in Montréal, a fantastic city, probably my favorite one in my trip to Canada. Forget the small streets, the small distances, the French strong influence, the small houses: Montréal is a real big city, with skyscrapers, large streets, long distances. There are also some ancient corners and oasis of relax, which makes the real charm of the city..but we’ll talk about it in a while. Everything you want is in Montréal: business city life, crazy nightlife, relaxing life, nature and history, this city can fill all your needs. Enjoy it at 100%! Since Montréal is a big city with big distances, in order to move you need to use the public transportation, which works pretty well. The subway covers the main spots of the city and is very easy to understand; besides that, it runs very regularly. When you arrive at the Train Station just follow the signs in direction to the subway (“Bonaventure” stop) and once you get there you can purchase a day ticket, it will cost you 8CAD and will give you access to the entire public transportation system for the next 24hours from the purchasing time. Together with the 1-day ticket do not forget to ask for a small map, every kiosk has a this pocket-size map with the subway plan and the city center plan. 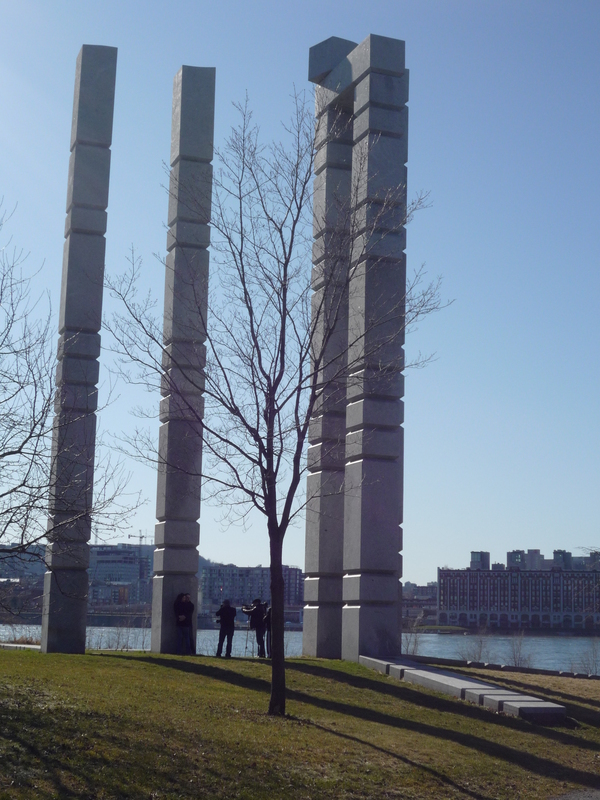 If you arrive in Montréal at noon, the first day can be very relaxing and be dedicated to some small nice areas in the city. 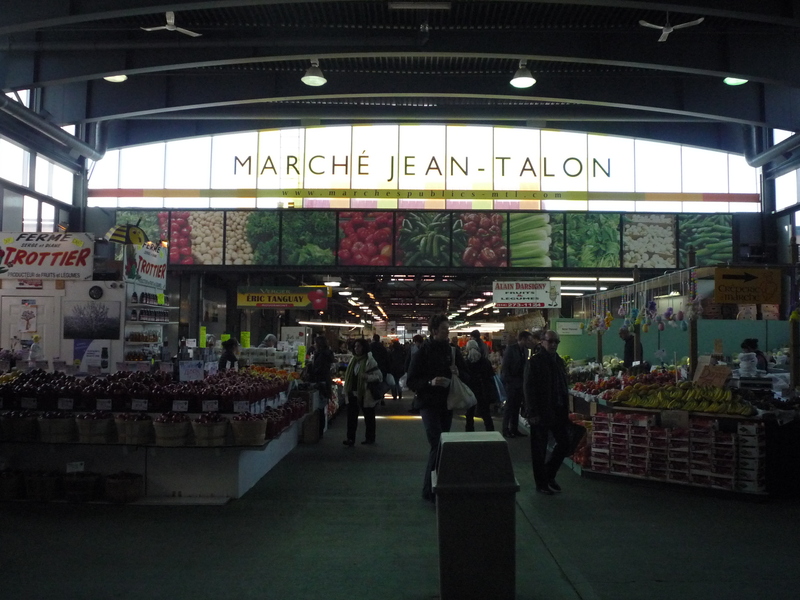 For instance, you can start with a visit to Marché Jean Talon, a very nice indoor market where you can find several specialties to buy or to taste on site: fruits, meat, fish, maple syrup, exotic specialties. You can get there via the orange line and get off at Jean Talon stop. A nice lunch over there is worth it! 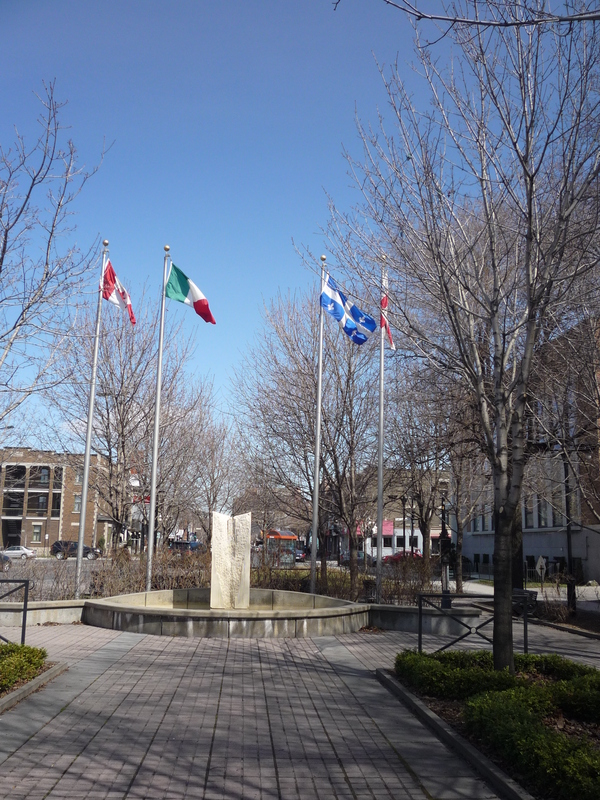 Just next to Jean Talon Market you can take St Laurent boulevard to arrive to Little Italy. There is nothing similar to the Little Italy in New York City, we are not talking about small streets with Italian flags and restaurants everywhere (also because most of the Italians nowadays moved outside the city and closed their activity), nevertheless it can be nice to see. Little Italy in Montréal is a set of large roads with some Italian stores and a few restaurants. 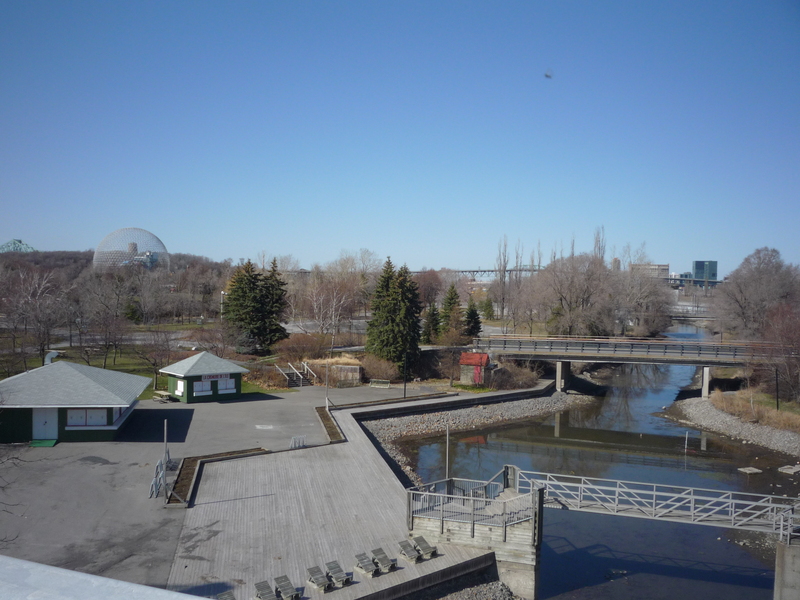 Since it is located near Jean Talon market, a walk there can take you just 5 or 10 minutes, so not such a big waste of time. Take the orange line again and stop in “Mont Royal”, after a 5mins walk from there you can arrive at Parc du Mont Royal, a nice green spot in the city. You can have a relaxing walk there. 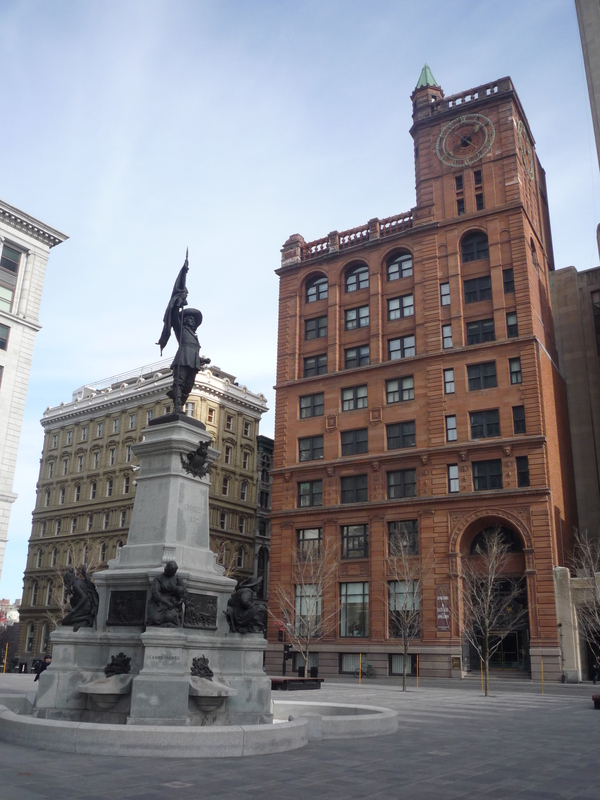 If you still have time during the day, you can anticipate another nice activity: visit Montreal’s downtown. 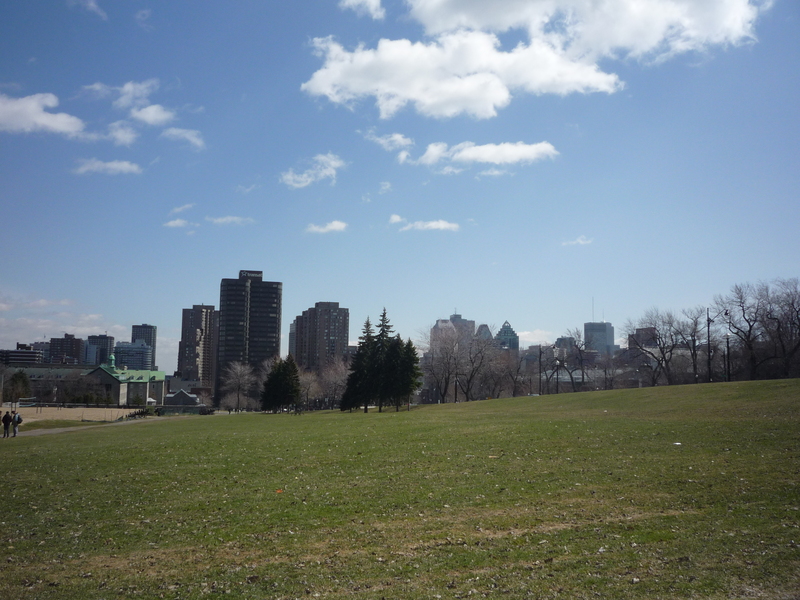 You will switch from the relax of Parc du Mont Royal to the chaos of the city, from the trees to the skyscrapers, a full immersion in the contemporary architecture, that it is totally worth. Take the orange line, stop at “McGill” and there you will be in the core of the modern city, with offices, stores, restaurants. This is also the place to do shopping, if you are a shopping lover you have to stop in the several stores there. If on the contrary you don’t love shopping and you think that nowadays most of the chains sell the same stuff (and I use the word stuff to be kind) everywhere, leave the stores behind you and go on with the city tour. 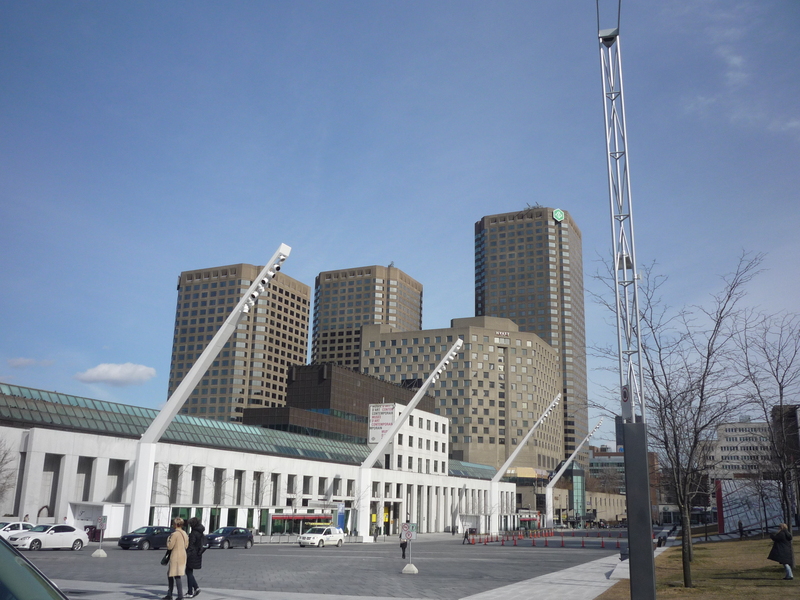 From McGill you can easily arrive at Place des Arts, where the Modern Art Museum is located. You can have visit there, it is quite interesting. After a short rest at the hotel, it’s time for nightlife! Montréal is known for its amazing nightlife, there is so much going on in the city! The best place to go is for sure the Quartier Latin (orange line, stop “Berri Uqam”), a district plenty of bars, restaurants, theaters, terraces, and where people are outside till late night. The Quartier Latin continues till the Village, the gay district of Montréal: this is also a nice place to spend the evening. All streets are crowded and with people having dinner or a drink. Definitely an experience not to be missed! The second day in Montréal will be extremely busy, with many places to see and activities to do (if you have a day more to stay, you can split these activities between the two days), so make sure to have a good breakfast early in the morning and to charge your batteries appropriately. 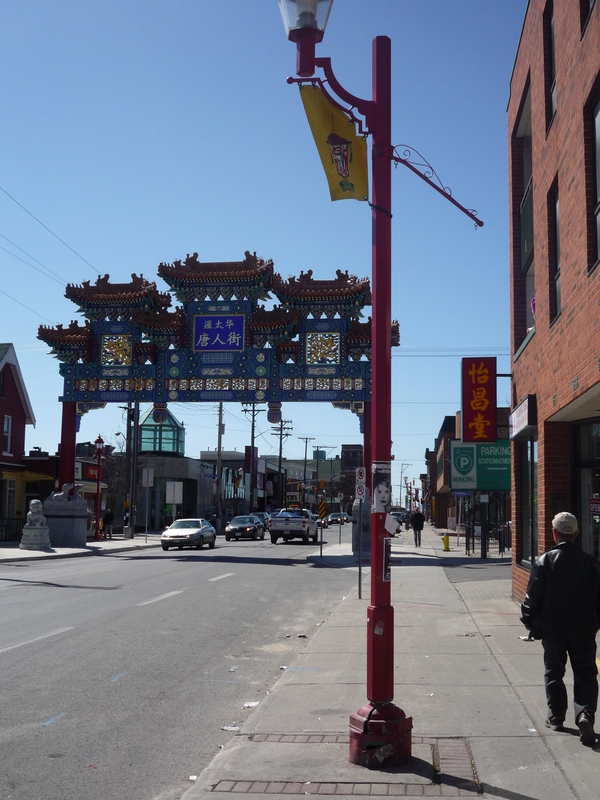 Take the orange line till the stop “Place d’Armes” and you will arrive in Chinatown. This area starts with a typical Chinese arch and continues with Chinese stores and restaurants. As of Little Italy, do not expect the same Chinatown as the one in New York City, nevertheless it is still nice to visit. 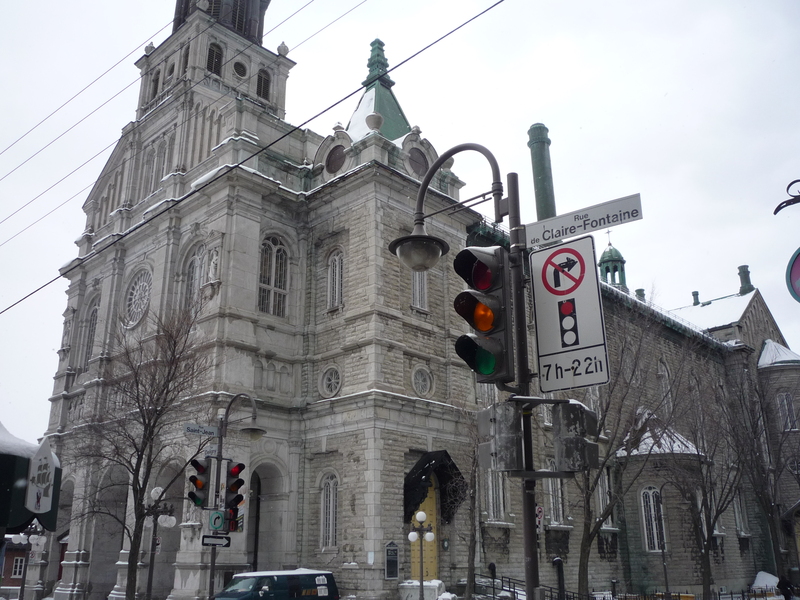 From Chinatown take rue St Urbain and you will arrive in Place d’Armes, a French-style square hosting one of the main attractions of Montréal: the Basilique de Notre Dame. This church is a pure artistic marvel, take a tour inside and you will be astonished in front of such a great masterpieces. Great windows, fantastic frescoes and statues, an atmosphere of pure rest and spirituality. A real historical treasure! From Place d’Armes, take rue St Sulpice (just behind the church) and you will arrive at the Quai, the city waterfront. This is the first step of an escape from the city noise, here you can start enjoying the rest and the fresh air coming from the river and the trees. Have a relaxing walk over there, enjoy the nature and the silence. 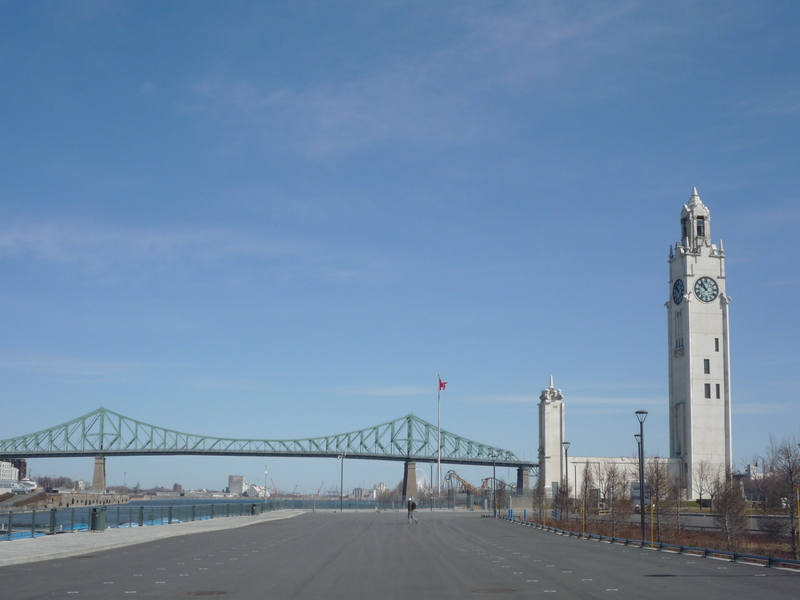 After a 20mins walk you will arrive at the best spot of the Quai, the Quai de l’Horloge. 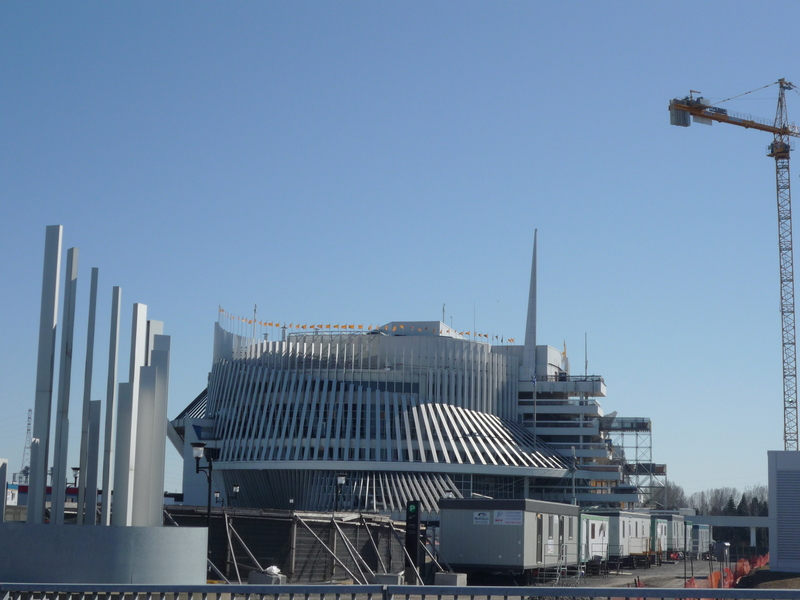 This is a pedestrian area where you will be able to admire the Clock Tower and the bridge as background. All this surrounded by the blue sky, the deep blue water and the green of the trees. Time to leave the riverside and go back to the inner side of the city. From the Quai de l’Horloge take rue du Bon Secours and after a while you will arrive at Place Cartier. 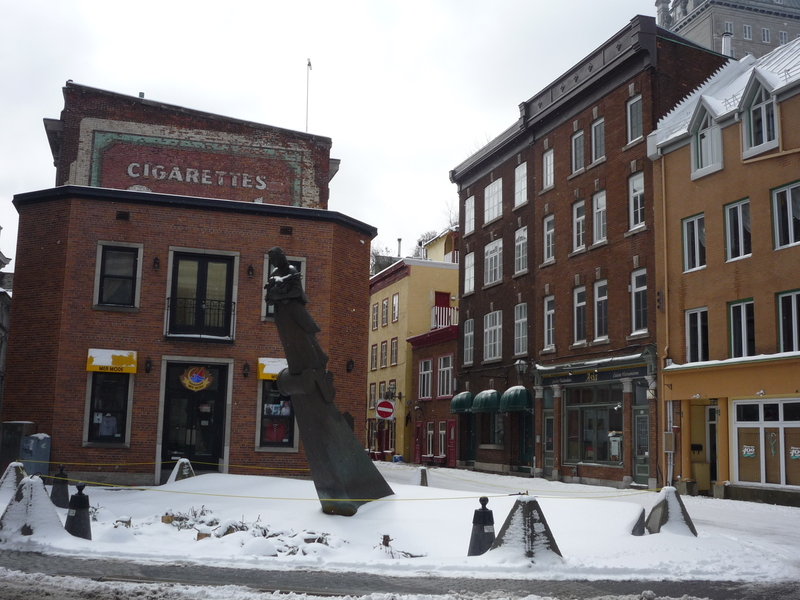 This is the Old Montréal, the part that looks like more Québec City, where you can really feel the French influence in the Renaissance style buildings, in the narrow streets and in the small restaurants. 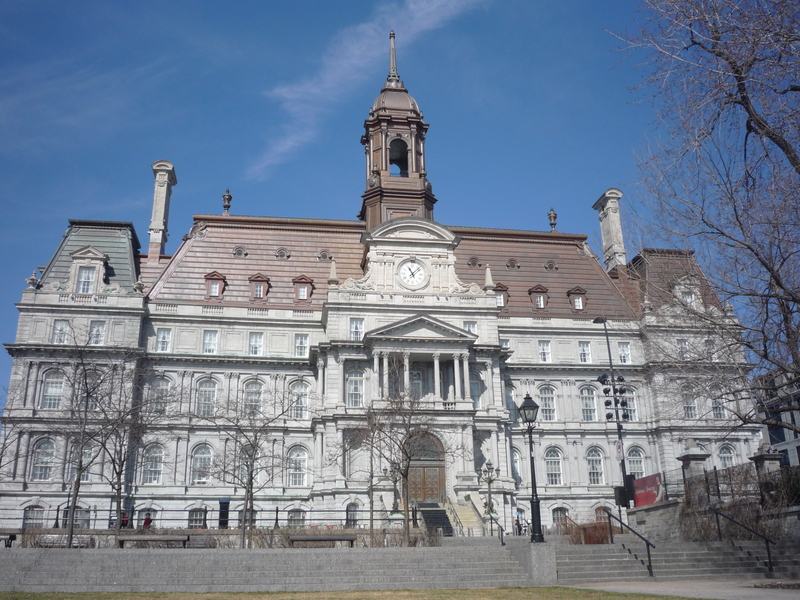 This is also the square where you will find the historical and elegant Hotel de Ville (City Hall). A lunch break over there can be a delight! Time to leave the old town and dedicate the rest of the day to the “natural” side of the city. From there you can take the orange line in “Champs de Mars”, stop at “Berri Uqam” and take the green line till “Viau” stop. 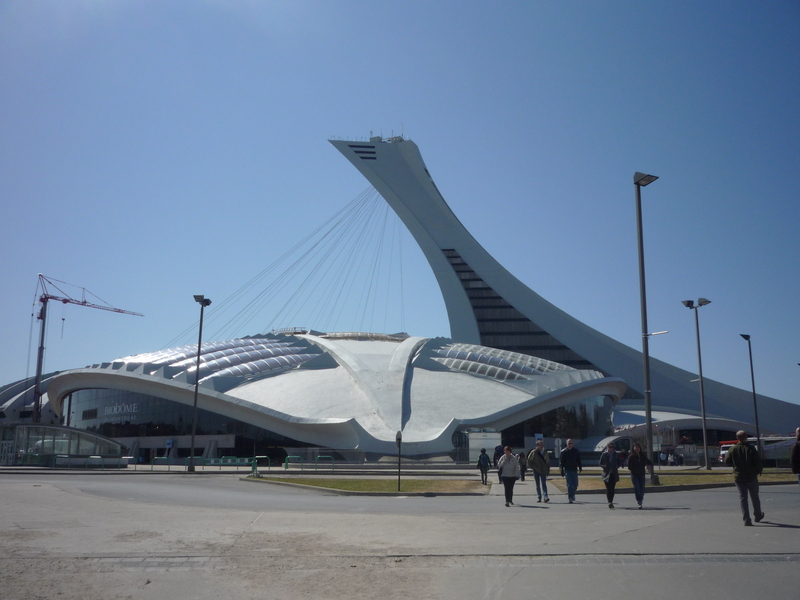 You will then arrive in front of the Olympic Stadium and of the Biodome. 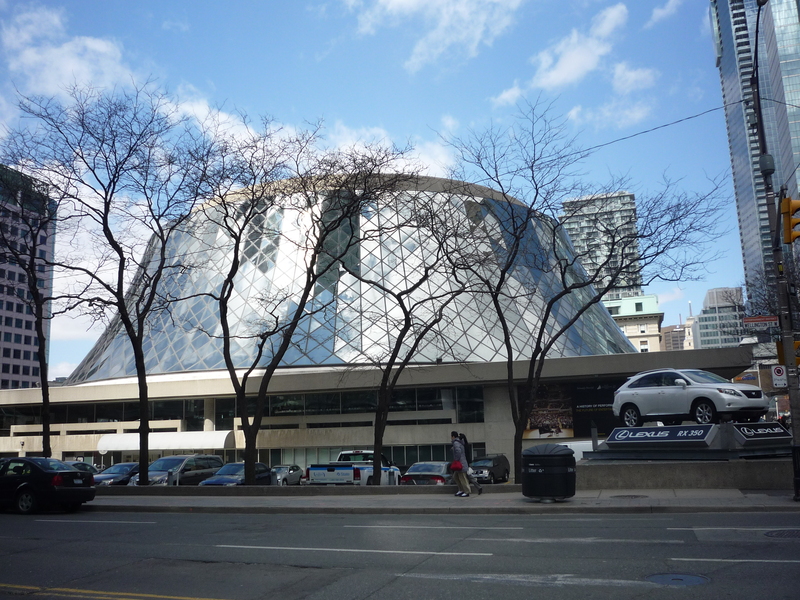 These two structures linked to each other are jewels of the contemporary architecture and are worth being visited. 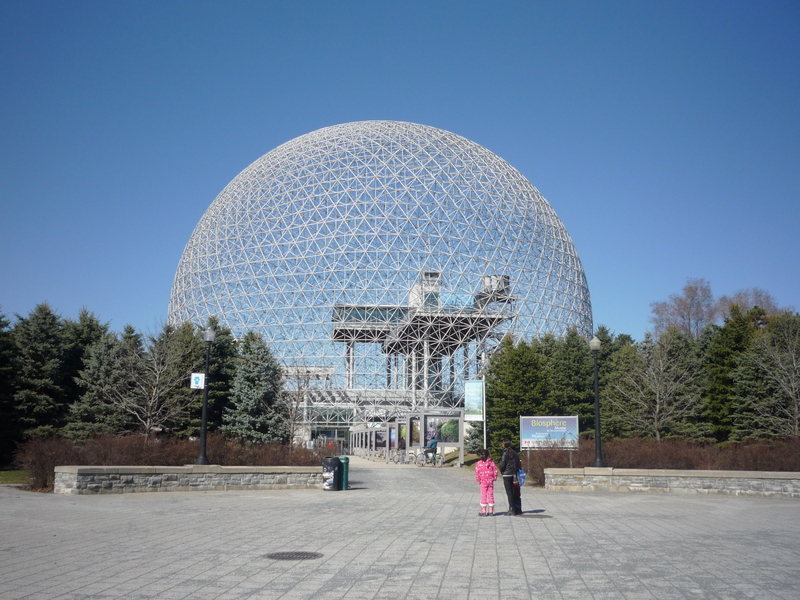 For this, there are several options, according to your preferences: visit to the Biodome only (18CAD), visit the Biodome and the Olympic tower (30CAD), or visit both places and the Botanic Garden (41CAD). 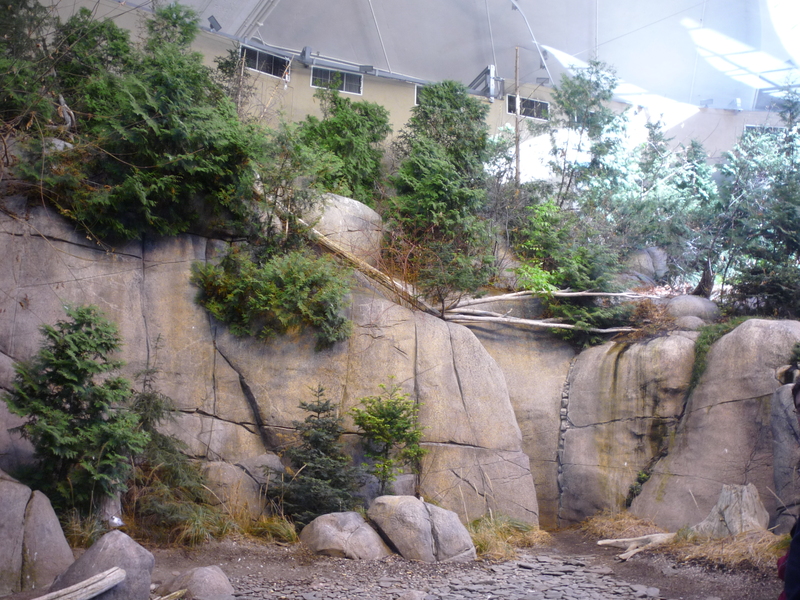 The Biodome is a fantastic place where you can see the reconstruction of 4 ecosystems of the Americas: the Tropical Forest, the Laurentian Maple Forest, the Gulf of St Lawrence, and the Sub-Antarctic Islands. An interesting tour will take you to the heart of these ecosystems and you will be able to see with your eyes the flora and fauna of these places. 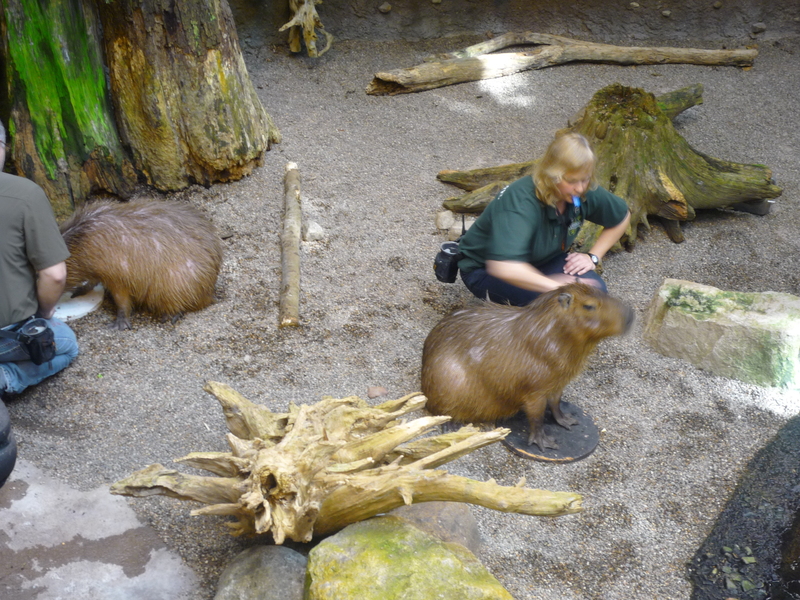 Besides that, the Biodome is used also as research and campaign place for conservation and study of the species. 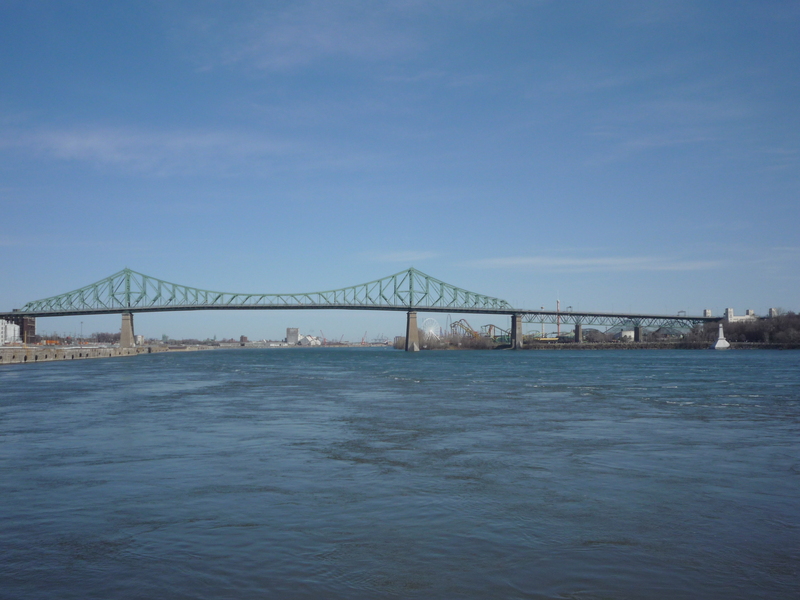 After this interesting visit, take the subway again till “Berri Uqam” stop and from there take the small yellow line till “Jean Drapeau” stop: you will just leave the city and will arrive in the islands side. 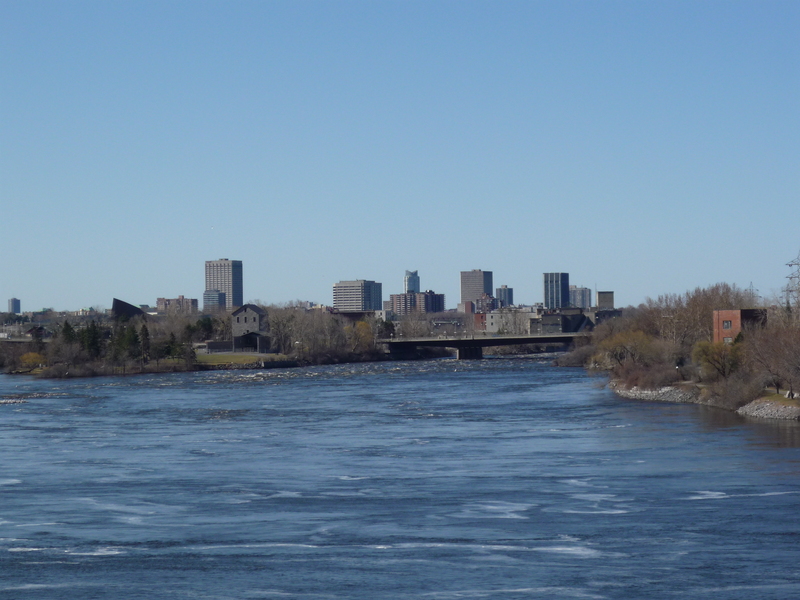 Montréal has indeed two main big islands in the middle of the river: Ile St Hélène (where the subway stops) and Ile Notre Dame (where the Montréal Casino is). This is probably the best spot in the entire city. Both islands are linked by a bridge and they are mainly pedestrians (cars can circulate only in restricted areas); the rest of the islands is totally filled with parks and paths for pedestrians, bike riders or skaters. Take your time to explore these islands by any means you wish. 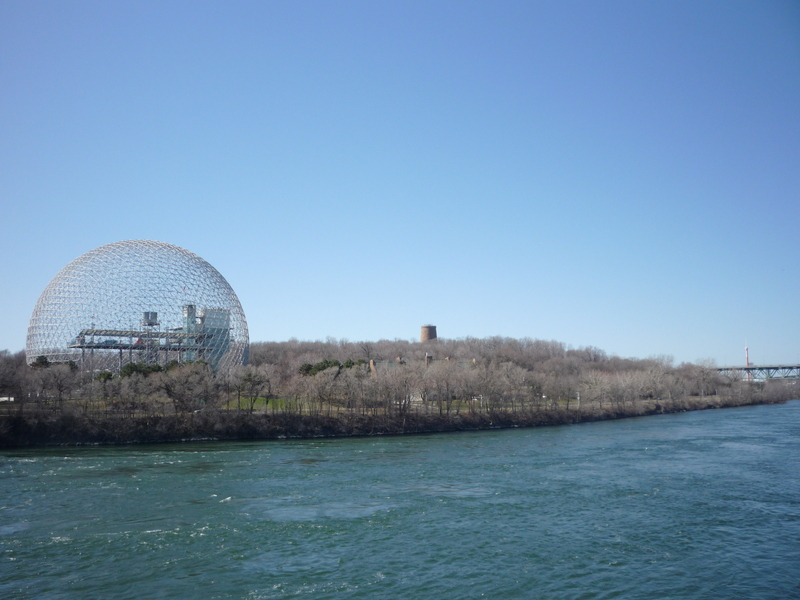 Start from the Biosphere monument (just outside the metro), have an enjoyable walk towards the other islands till the Casino. Enjoy the silence and the nature around you, at a moment you will even forget that you are in a city. 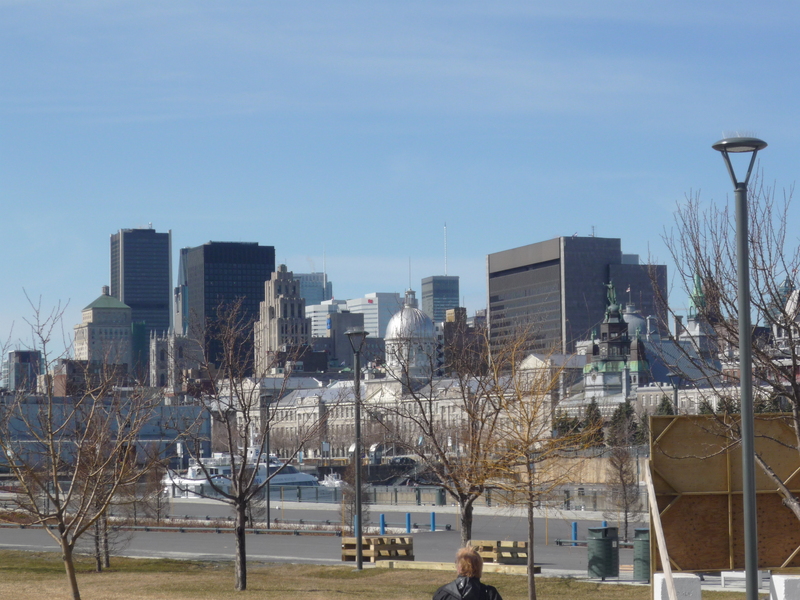 The only moment you will remember it will be when you are in Jean Drapeau park and in front of you you will have the amazing view of the city. The wonders inside these islands and the view that you will have on the city will leave you speechless. After this big day in the city, enjoy again Montréal nightlife, taste some local specialties and enjoy some nice drinks. Besides the food with maple syrup, there is also another typical food of Montréal (and Québec region in general): poutine. Poutine is simply French fries with melted cheese and a beef sauce on the top. I know it’s not haute cuisine, but it is worth tasting it, it’s always nice to eat typical food! Something that you should also bear in mind about Canadian restaurants is that the price shown never includes local taxes and tips, so you always need to add this amount to your bill. This rule is applied to everything: transports, clothes, beverage, hotels, everything is shown without taxes. It is a little bit annoying but there is no choice, so be careful and make your calculation in the right way! Our staying in Montréal is unfortunately over. If you have more days available, I strongly suggest you to stay one day more and maybe split the itinerary of day 3 between the 2 days. 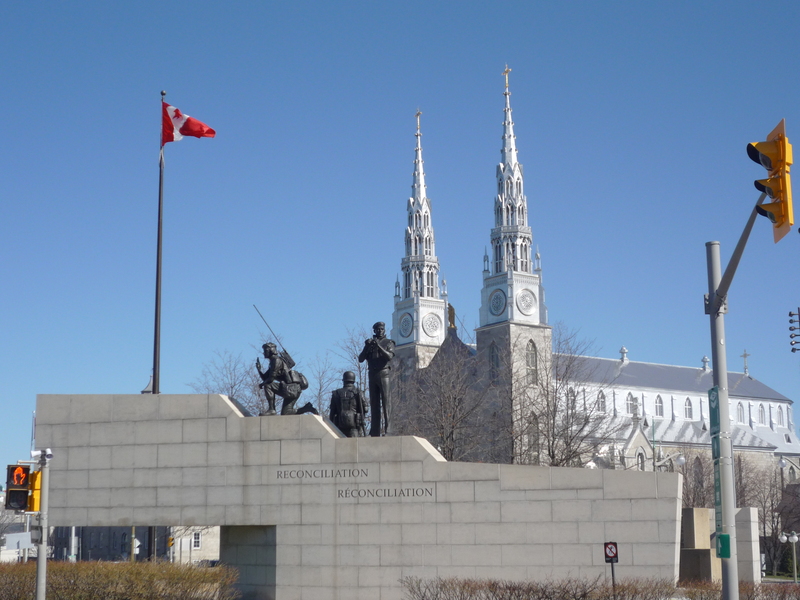 It is time to say goodbye to Montréal and explore the capital of Canada: Ottawa. There are many ways to reach Ottawa from Montréal, but once again I decided to take the train. There are trains connecting the two cities all day long, I took one at 9:00 and after 2h20mins I was in Ottawa. Ottawa does not have the structure of a big city like Montréal but it doesn’t have the structure of a small town like Québec neither. The charm in Ottawa is quite special: capital of Canada, it has many institutional buildings that give almost an imperial aspect to the city. 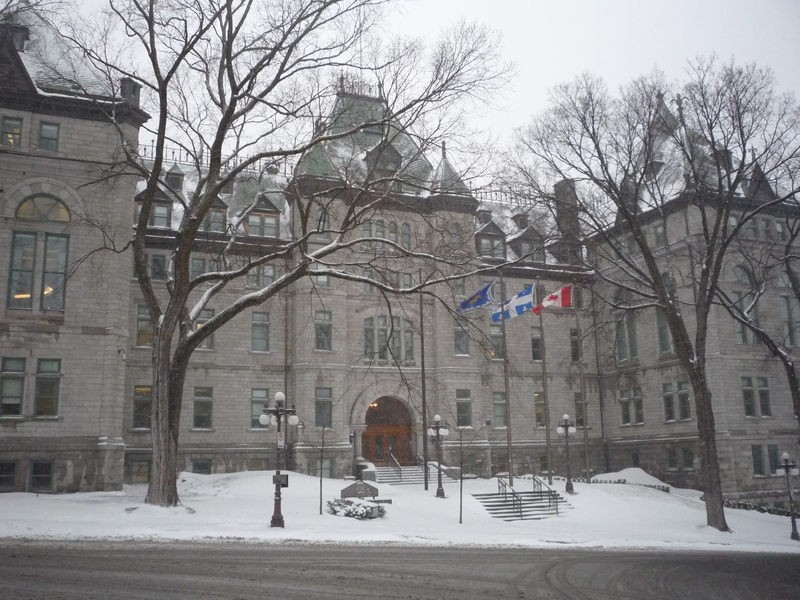 Together with the extremely elegant buildings is the quiet of the nature, the deep blue river and the Rideau Park ( one of the UNESCO heritage treasures). Life in Ottawa seems going slower, there are less people in the streets and the ones who are around are not in a rush like in Montréal. From this point of view Ottawa looks like more human and easier to live. The train station is linked to the city center by bus. And actually this transportation and your feet will be the only way to move in the city. There is no subway in Ottawa, everything works by bus. 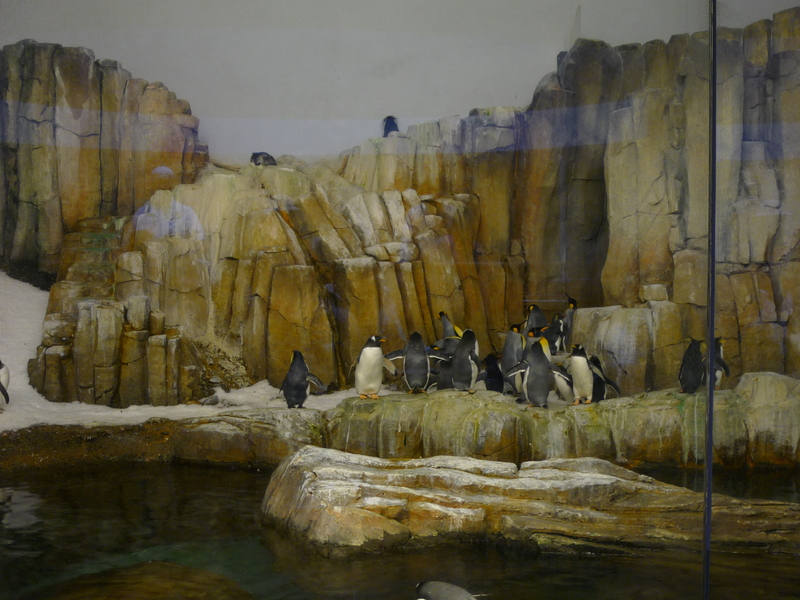 Each ticket costs 2,85CAD and is available in some kiosks located in various parts of the city (the main one is in Rideau Centre, the big shopping mall of the city). It is not very practical but at least buses run very frequently. Once you get to the city center, you will have the afternoon and evening to start exploring the city. Therefore it is better to take it easily (especially after the busy days in Montréal!) and have some shopping time in the city. 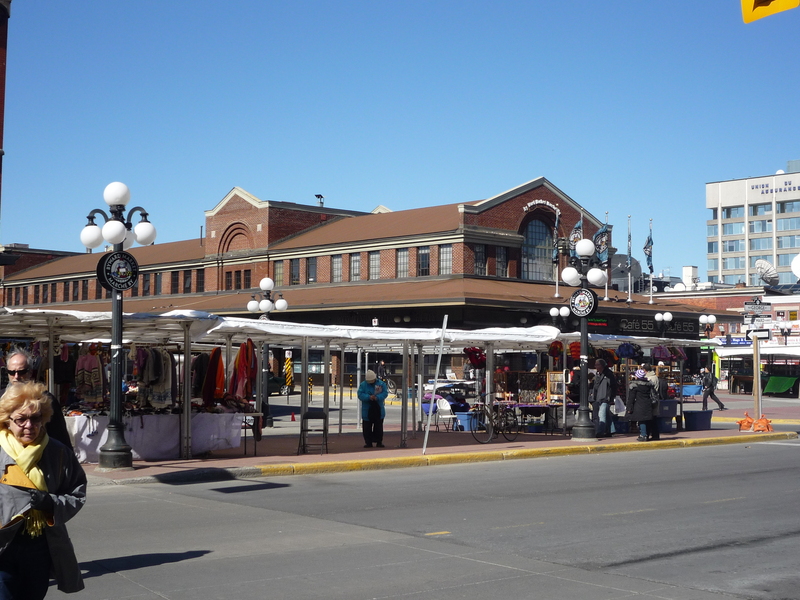 Take the bus to “Rideau Centre” stop and take the street behind to enter in the ByWard Market. 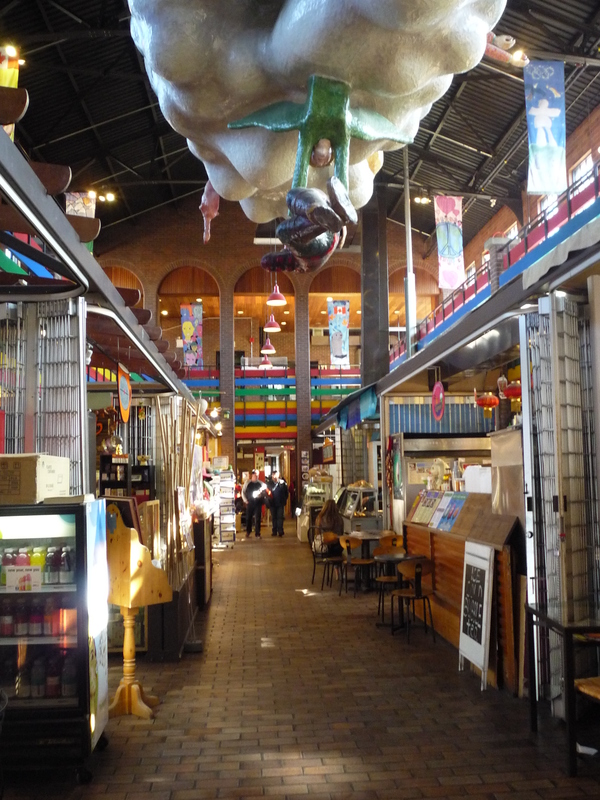 This is a outdoor and indoor market, with some pedestrian streets, with restaurants, cafes and interesting stores. This is a great place for shopping (since there are no chain stores, but private ones) and for nightlife, since after 19:00 these streets get crowded of young people drinking and eating. In the middle of this area there is an old building with the market itself and food court. Stop by there and taste something special. 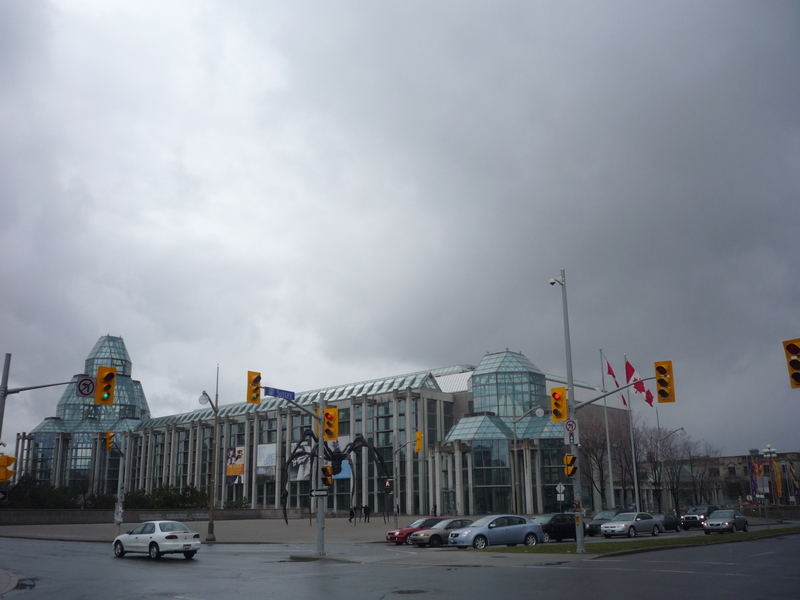 If you are a lover of chain-stores shopping, you can also have a tour at Rideau Centre. This is a immense shopping mall located just at the bus stop. You can go there to fill your luggage and empty your wallet. 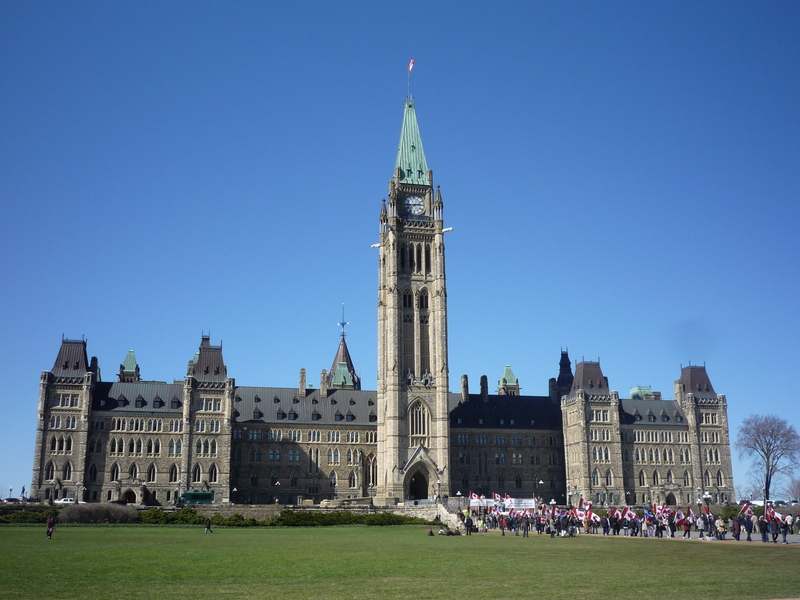 The second day in Ottawa is the the big day, many things to see but at the end of the day you will be so happy for having done it. 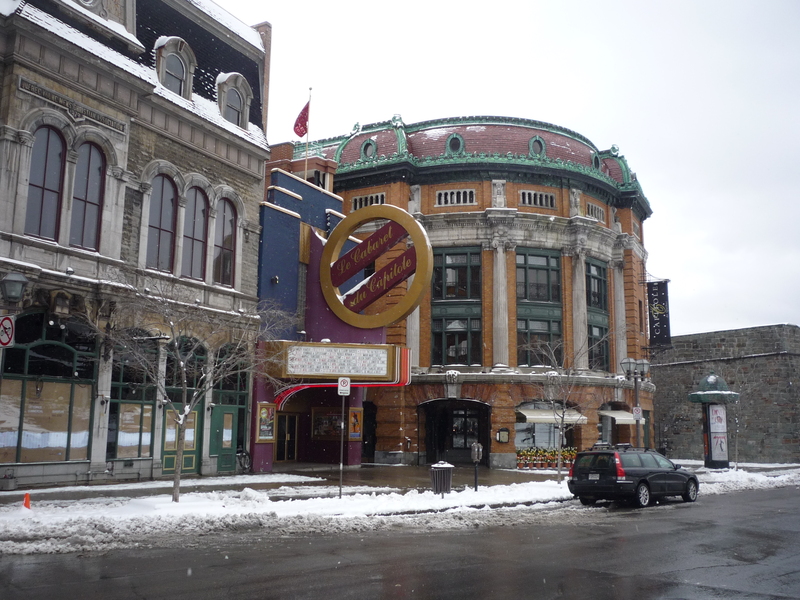 From ByWard Market, take the street behind and after few minutes you will arrive at Notre Dame Basilica. From the outside this church can look like a normal building, light grey and with nothing special, but all your disappointment will go away once you get in. A dark blue roof with golden stars invades your view immediately. For some aspects this church recalls the one in Aachen (Germany), especially thanks to the charm these blue walls have. Fascinating statues and windows complete the masterpiece. In front of the basilica you will find the Peacekeeping monument and the Modern Art Museum, located in a contemporary-style building. 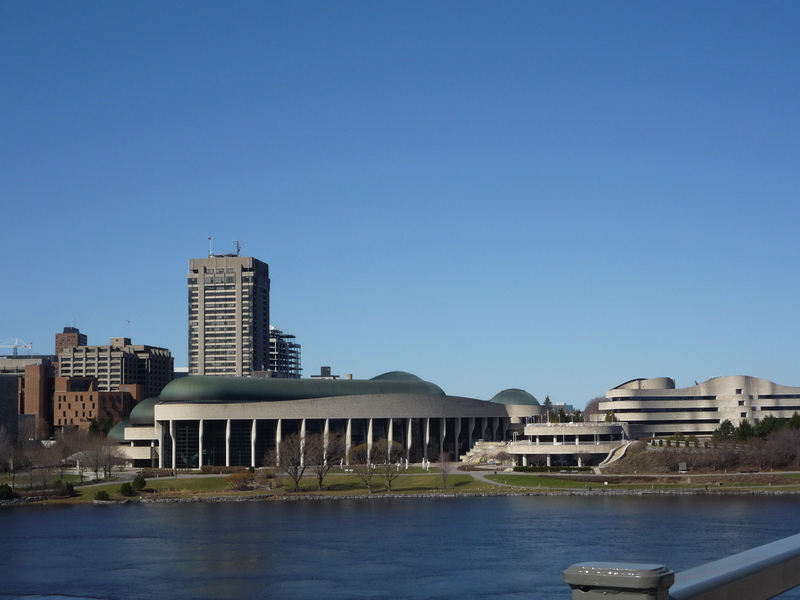 Once you cross Alexandra Bridge you will find a very interesting building on your left, with a green roof and with columns on the side that create almost a wavy movement along the building: this is for me the jewel of the city, this is the Canadian Museum of Civilization. 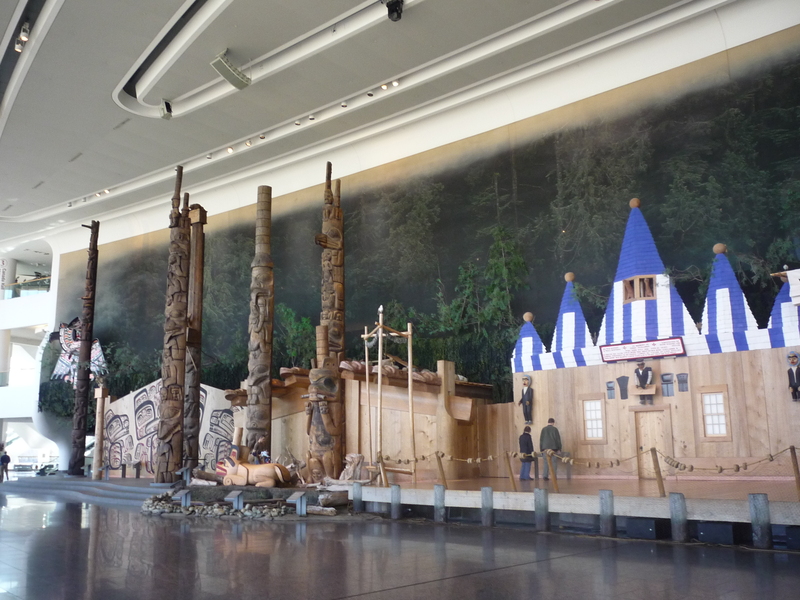 The museum is open everyday, from 9:00 to 17:00, and the entrance fee is 18CAD. It is structured in 4 floors, all different from each other. 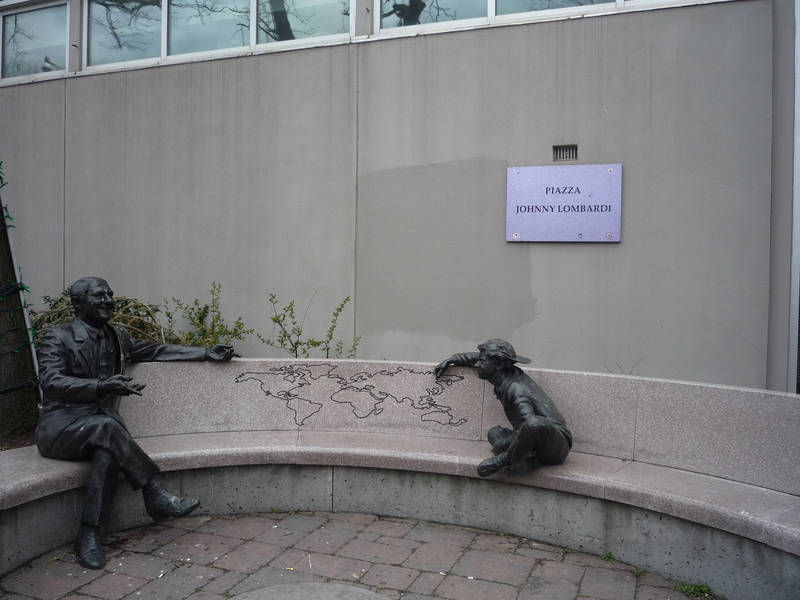 Level 1 is dedicated to Canada’s First Peoples: their histories, cultural identities, artistic expressions, and their traditional and contemporary ways of life. 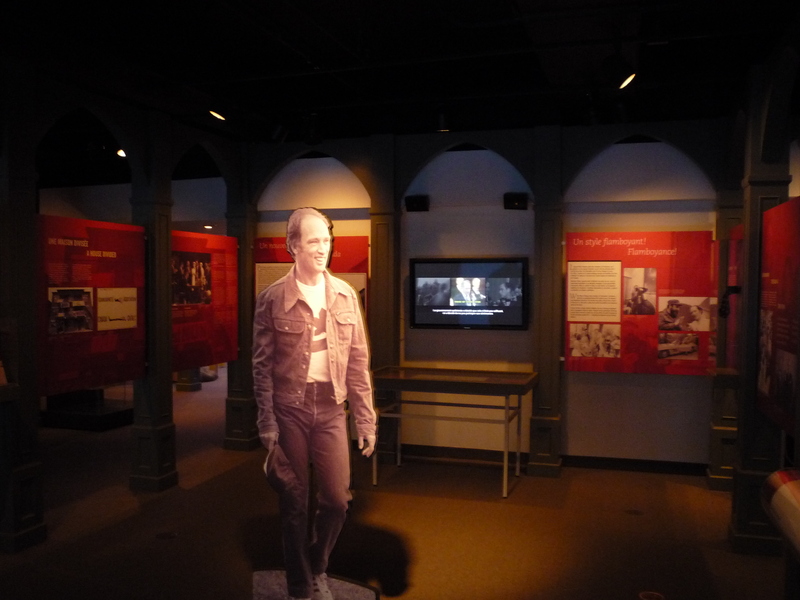 Level 4, called “Tete-à-Tete”, gives you the chance to meet some of the men and women who built Canada, led it in peace and war, created its institutions, fought for a cause and inspired the country. 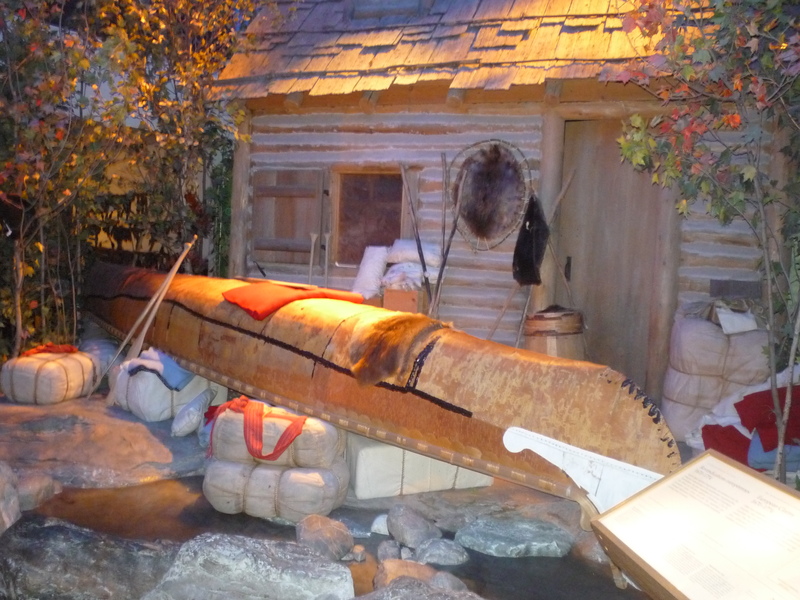 Level 3, the biggest one, called Canada Hall, recreates the typical ancient Canadian villages, with reconstructed buildings and other historical settings that evoke a sense of different periods and different regions of the country. Level 2 is dedicated to temporary exhibitions (when I was there, there was an interesting exhibition about the main religions in the world analyzed through their main rituals and symbols). 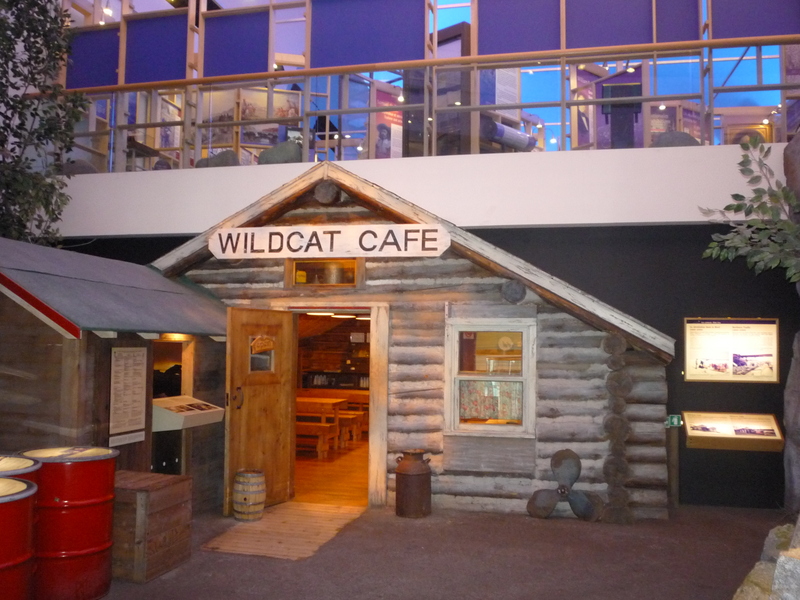 The visit to this amazing museum will take you several hours, it is definitely worth it. Once you exit the museum, have a nice walk along the river till Portage Bridge. Cross the bridge then and take Bronson street and when you will arrive in Somerset street you will arrive in Chinatown. The area is full of Chinese stores and restaurants, but quite empty. 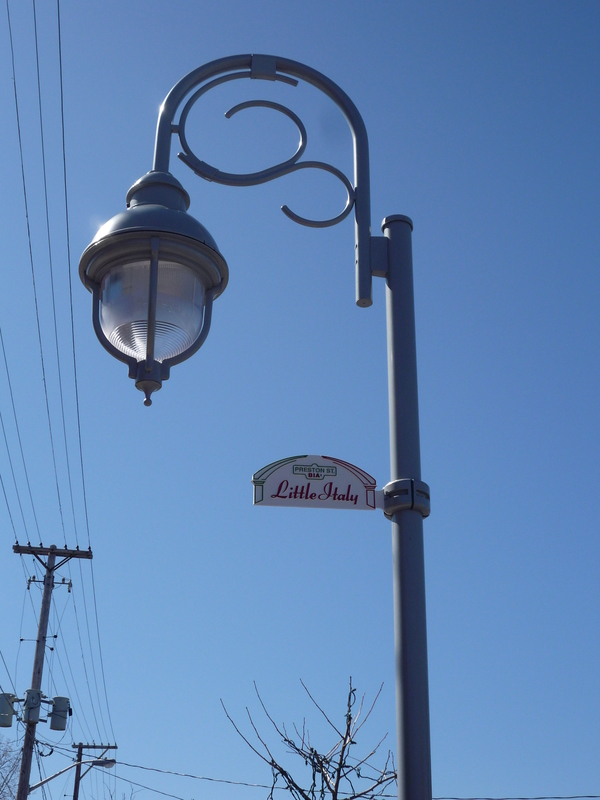 Next to it you will also see Little Italy…little in the real sense of the word, since it has almost disappeared! From what is left of Chinatown and Little Italy, take bus 2 and stop at “Banks” stop, you will find yourself in the Village. 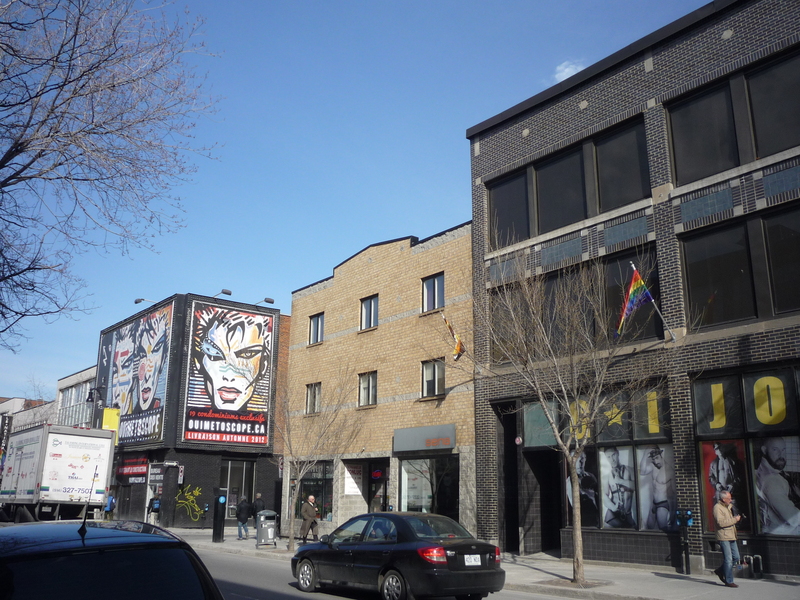 Take a nice walk in the gay district of Ottawa. From the Village, take Wellington street and after 5 minutes you will arrive in front of the symbol of Ottawa, the Parliament Hill. This is a real symbol for the city and for the entire country, a set of fantastic elegant buildings hosting the Canadian Parliament and all the history behind. 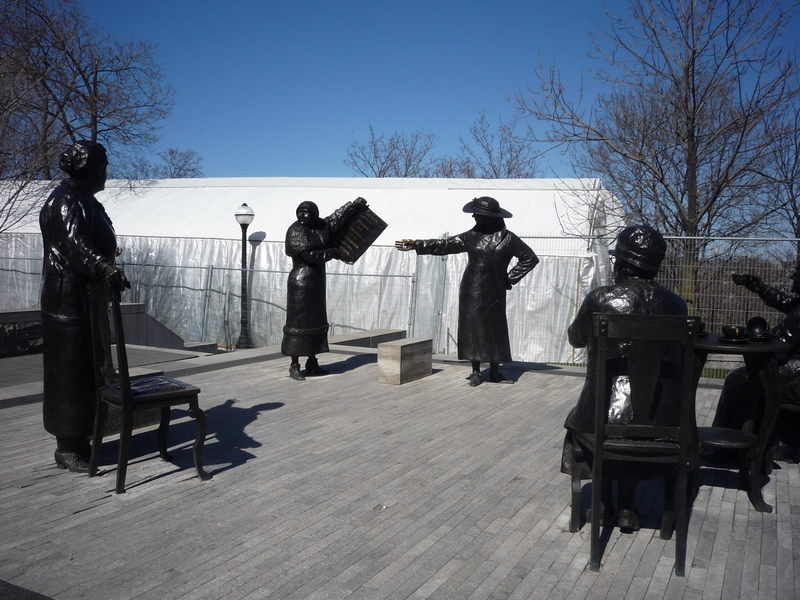 Behind the Parliament you will find several statues of statesmen who created the actual Canada and a special statue reproducing the moment when Canada gave women the right to vote, one of the first countries in the world to make this step. Time to abandon the city and to immerse ourselves in the nature! 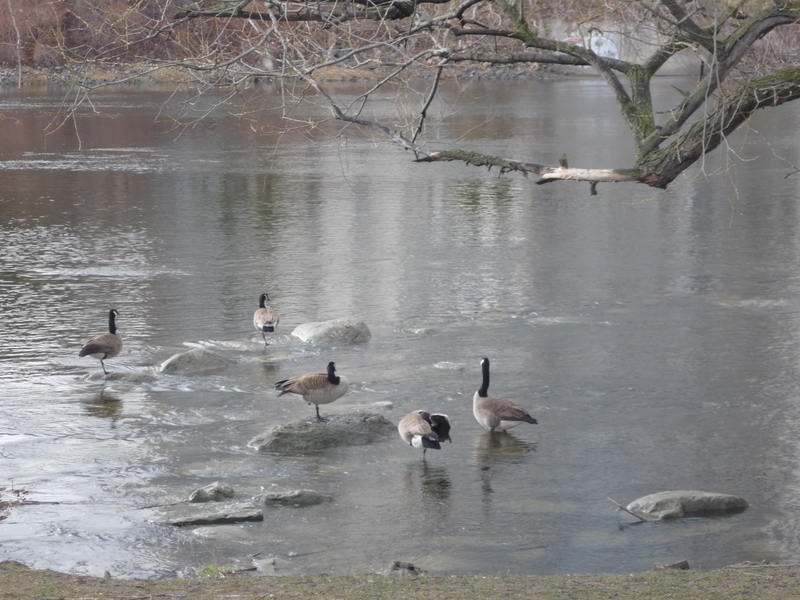 From the Parliament Hill you can take the riverside and have an enjoyable tour in Rideau Park, a fantastic green path that extends all along the Rideau river for many and many kms and that has been also recognized as UNESCO heritage treasure. By bike or on foot, enjoy a relaxing walk there, just next to the river and surrounded by the green of the trees. There is no better way to remember Ottawa! Time to leave the capital now and go to one of the biggest cities in North America: Toronto. In order to get there, you can do like me and take a direct train. There is one leaving from Ottawa station at 8:36 and arriving in Toronto at 12:57. It is suggested to take an early train (or any other kind of transportation) because the trip is quite long and because Toronto requires more time to move. 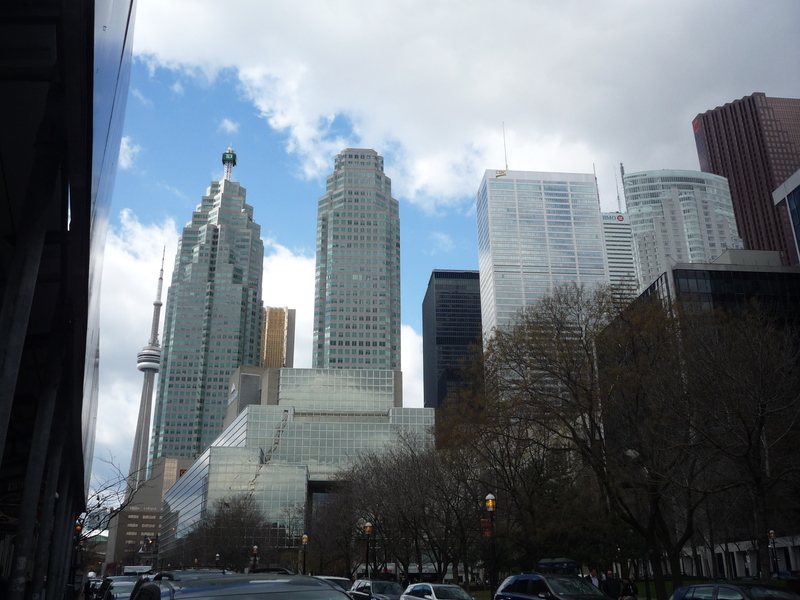 Together with New York City and Chicago, Toronto is the 3rd city in North America in terms of size of downtown. If Montréal is big Toronto is huge. Distances here are multiplied by 2 and everything gives the idea of the massive, especially the huge skyscrapers downtown. When you arrive by train, you will get off at the main railway station, located in the core of the city and next to the subway station called “Union”. From there you can easily reach your hotel. As big city, Toronto needs to be visited by public transportation. You can purchase a 1-day pass at any kiosk in any subway station at 10,50CAD; this pass will give you access to all kind of transportation. If I have to be honest, for a big city Toronto transportation is quite deceiving, just 2 subway lines doing from north to south and old trams moving from east to west and viceversa. Nevertheless this network can take you everywhere in the city. Once you understand the way the transports work you will understand the city: it is very important to understand the east and west side and their crossing with the subway, the rest will come naturally. The first day you will probably be tired for the journey, so maybe you can do something relaxing: you can explore the multicultural side of the city. For years and years Toronto has attracted populations from the entire world, who settled there and create their own neighborhoods. It is nice to explore these different areas and see how people brought a part of their culture and traditions over there. 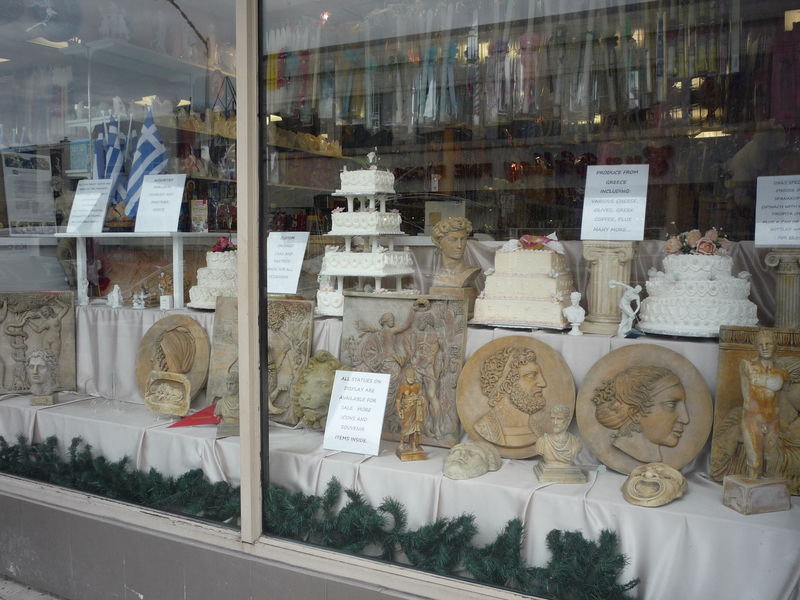 You can start your “multi-culti” tour by Greektown. 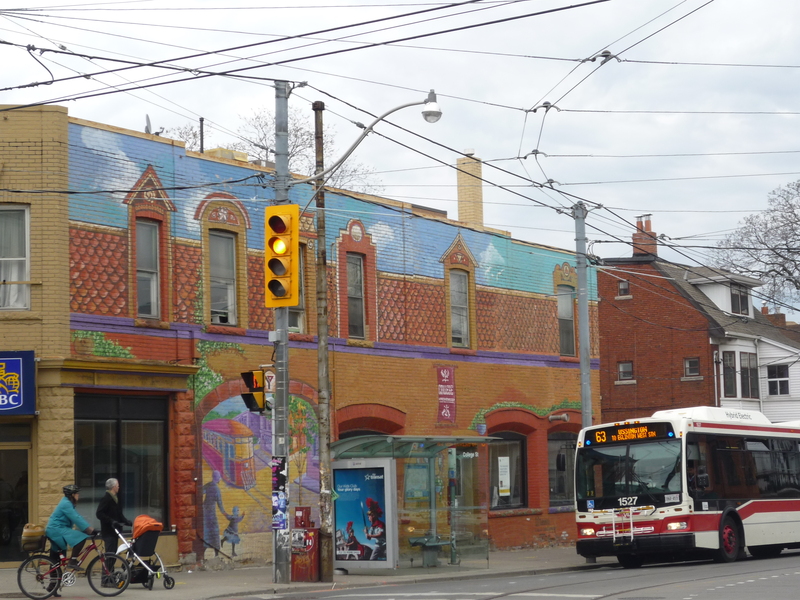 Take the Bloor Subway line (green line) and stop in “Broadview”. 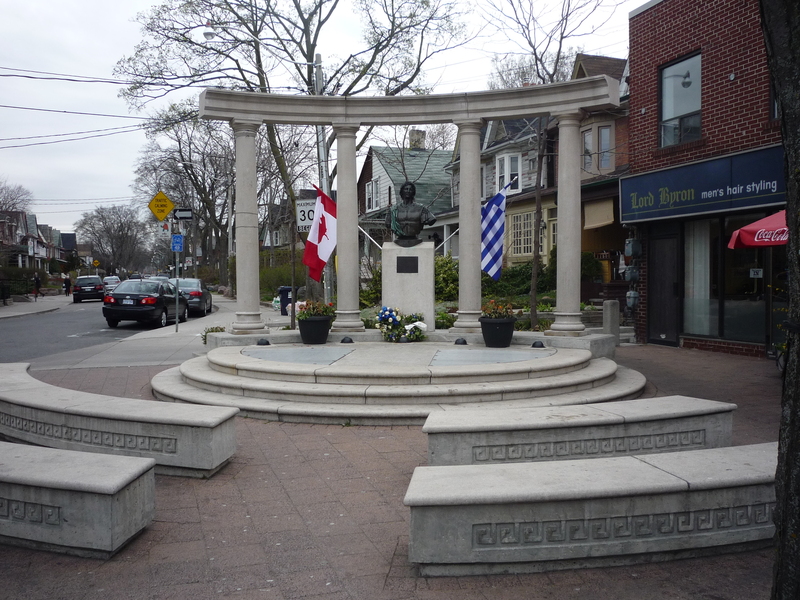 Take the main street located at the exit and you will arrive in the Greek area of Toronto, a long street with Greek flags, shops, restaurants and cafes. The kitsch is the main guest over there, thanks to the numerous fake statues and columns. There is also a statue of Alexandre the Great and with the Canadian and Greek flag to symbolize their good relation. Let’s leave the Mediterranean to go to the Far East. 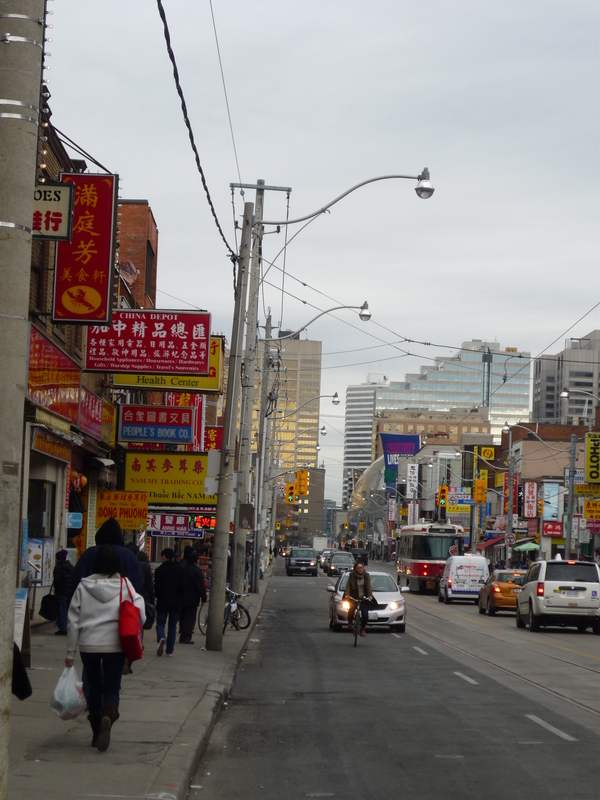 Take the subway till “Dundas” station and from there take the tram till “Spaldina”: you will arrive in Chinatown. 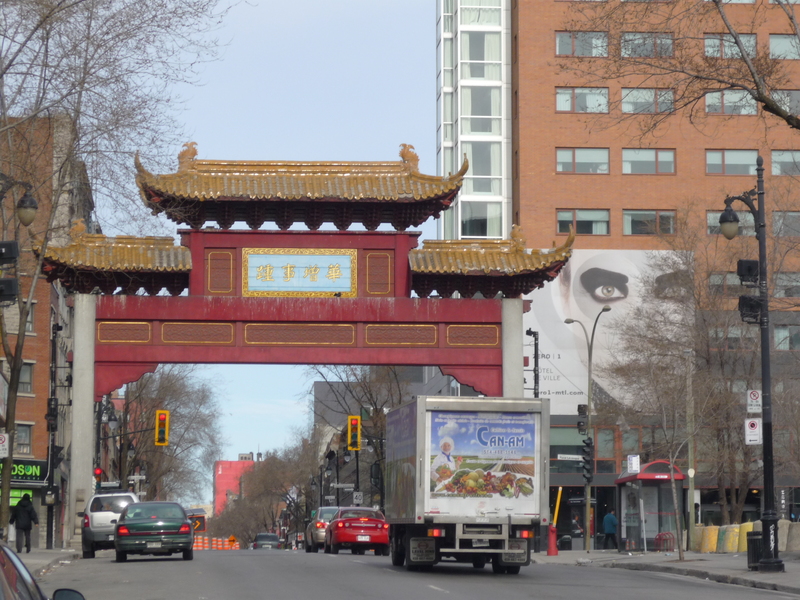 Compared to the one in Ottawa and Montréal, this is bigger and more Chinese. Chinese shops ans restaurants everywhere, with Chinese alphabets and with Chinese people. From Chinatown walk till College Street and you will arrive at Kensington Market, another long street with particular shops. After a while Kensington Market will disappear and leave the place at what is supposed to be Little Italy. It’s supposed to be because nowadays, like in Montréal, most of Italians moved outside the city and closed their business, therefore there are only few shops and restaurants left. Along this street you can also find the Italian walk of fame, with some images of famous Italo-Canadians. Keep on walking along Little Italy and, when you arrive at “Orrington” tram stop, take the tram till “Dundas” and you will arrive at Little Portugal. Differently from Little Italy, the Portuguese district stayed more intact and you really can feel the influence in the shops, restaurants, bakery shops and churches. Now take the tram from Little Portugal and stop at “Dundas” station: you will arrive at the famous Dundas Square. This square is the Times Square of Toronto, the core of the city life, a square full of life and young people and with modern buildings with huge screens and advertisements on their facades. Take your time to have dinner there, the nightlife is great, there are plenty of places to go and people all around. 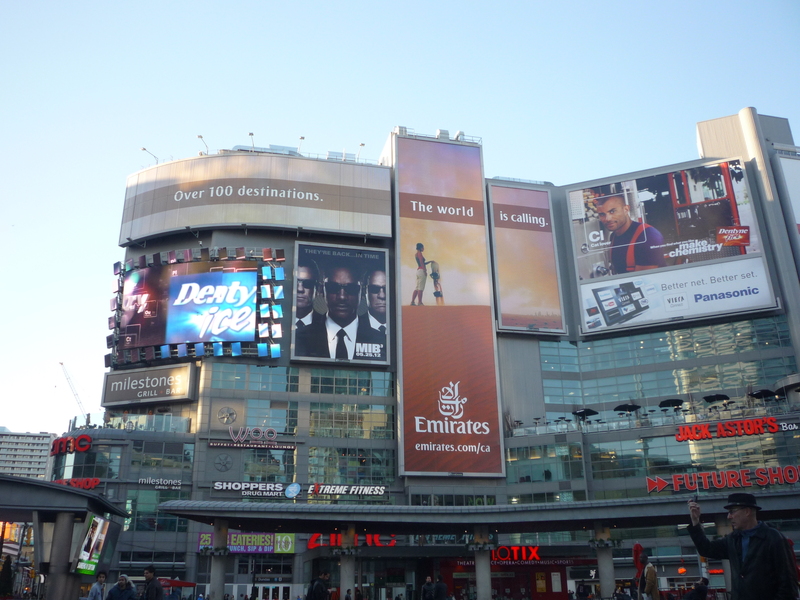 If you like shopping you can also take the opportunity to go to Eaton Centre, a huge shopping mall located in a side of Dundas Square and where shops are open till late. 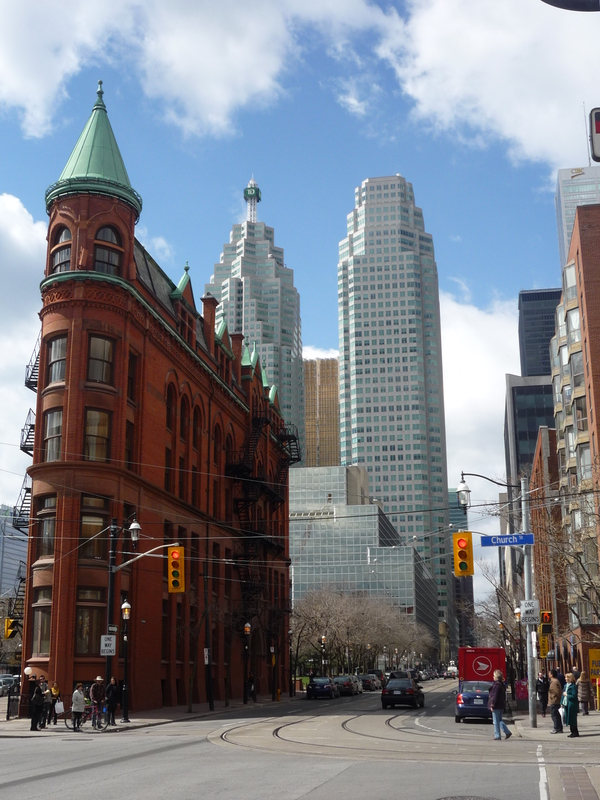 After a big and deserved rest, you can have a big breakfast and keep on exploring Toronto. 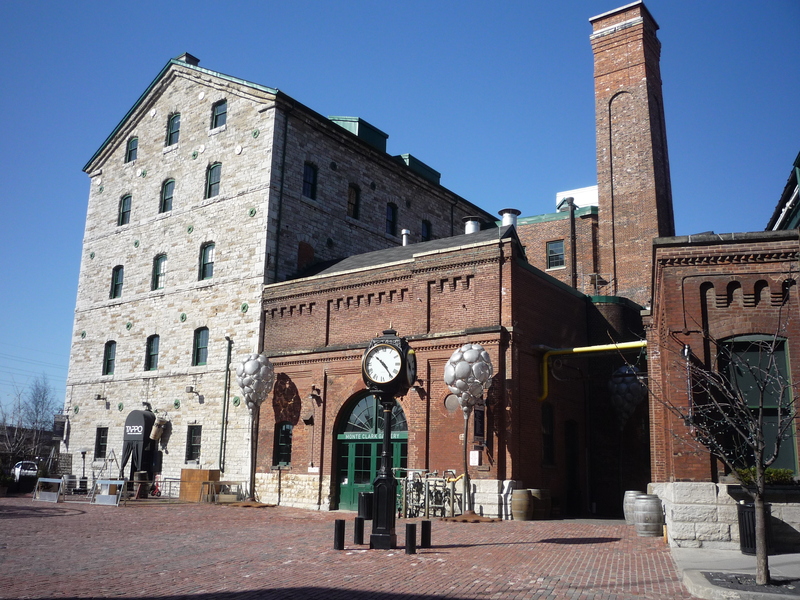 Start your tour from the Old Distillery District, a very special area, very quiet during the day and overcrowded during the night. Take the metro till “King” stop and from there take the tram till “Parliament street”, the Old Distillery district is just there. 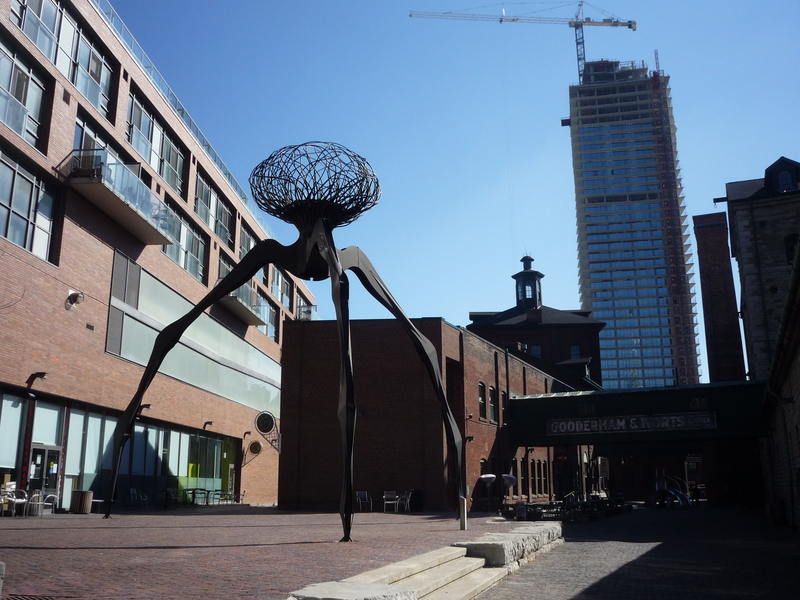 Keep on walking through Parliament street and you will arrive at the Queen Quay. 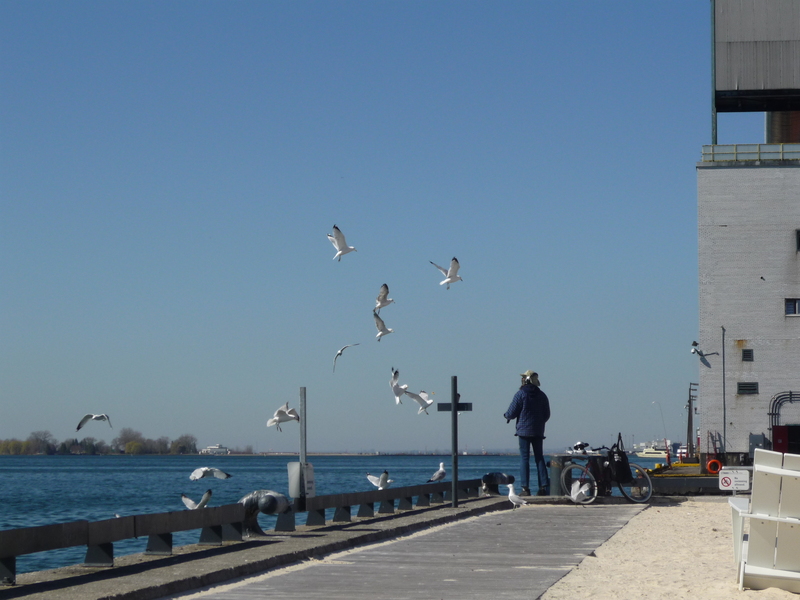 This is where Toronto’s waterfront starts. During my staying there were a lot of works in progress, because they are building some amazing structures: artificial beaches, restaurants, parks, fountains. I’m sure at the end of the works the result will be fantastic! Anyway you can already enjoy some part of them. 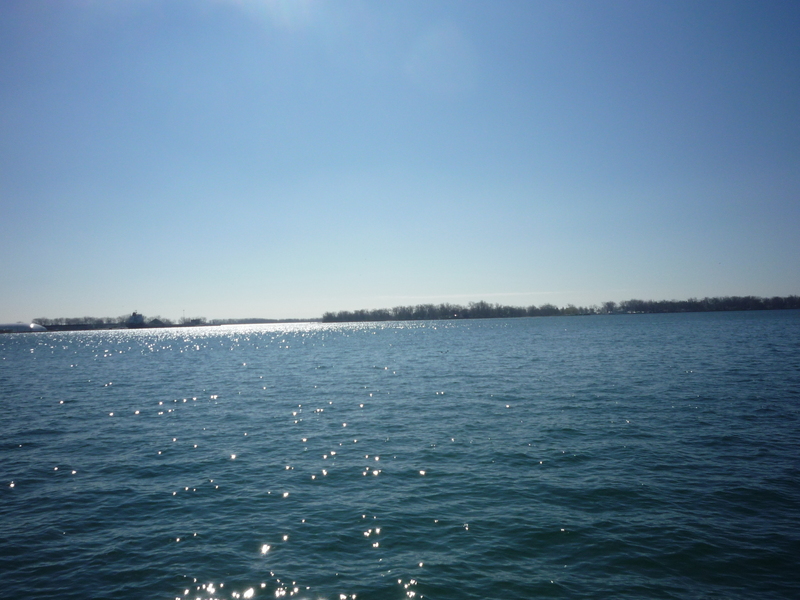 Have a nice walk along the coast, enjoy the sun on your eyes and the game of lights that the sun does when it reflects on the Ontario lake. Seat in one of the benches and simply enjoy the fresh air and the birds singing, this is probably one of the few areas where you can escape from the chaos of the city. 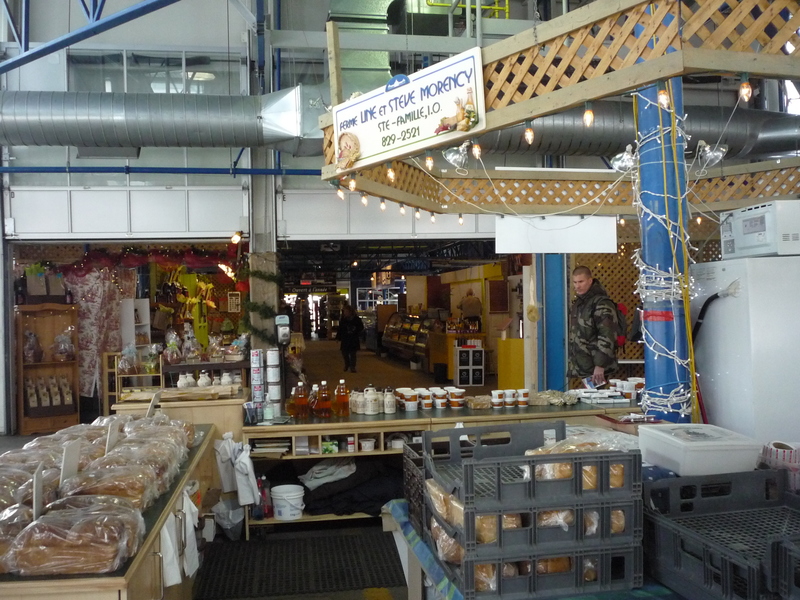 Keep walking along the coast till Jarvis street and after 5mins you will arrive at St Lawrence Market. 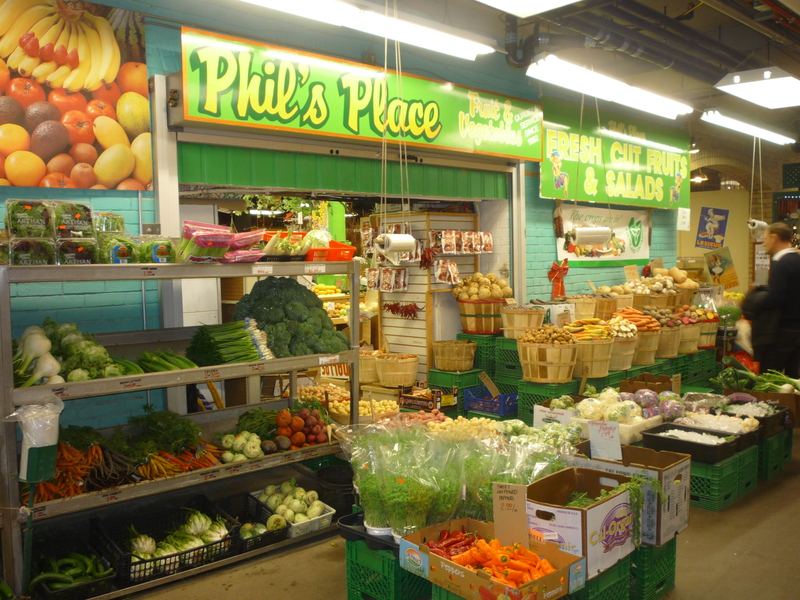 This is an indoor market where you can find all the specialties you want: fruits, vegetables, meat, fish, Canadian food, Chinese food, Italian food…everything you want is there! You can buy food and you can also eat on site. A great place to have a very good lunch! After a good lunch in St Lawrence Market, take Front street: this is the street where you will abandon the normal-size buildings and the old town and enter into the modern area. Starting from there, the huge skyscrapers and the large streets start. 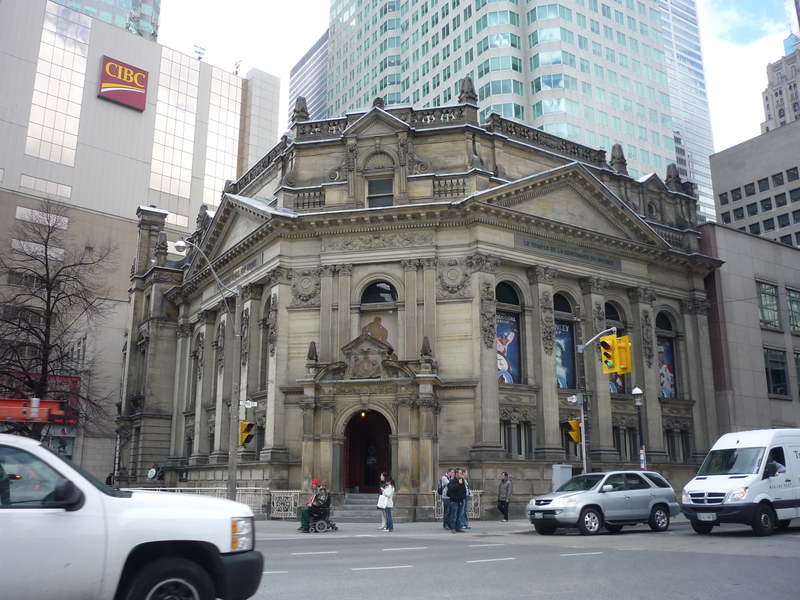 The first attraction you will see in the street is the Hockey Hall of Fame. 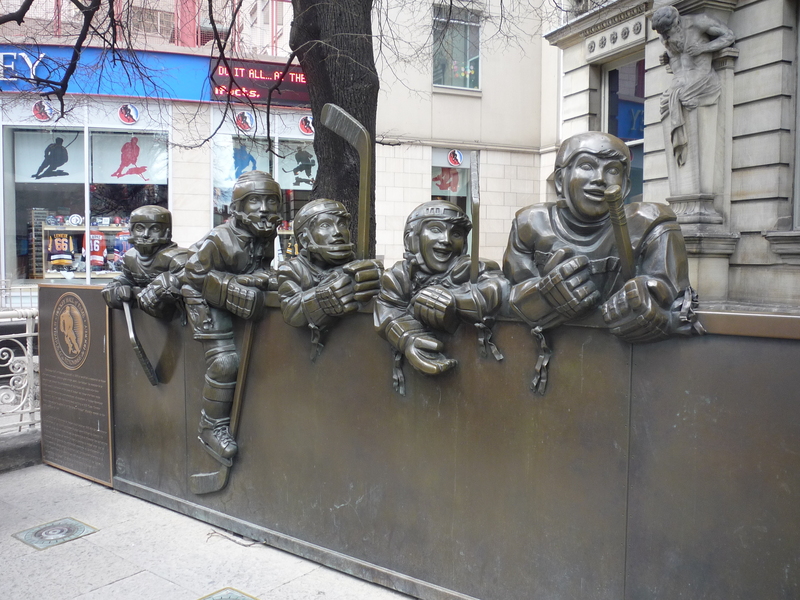 Hockey is Canada’s national sport, so Canadians decided to honor this sport and its main players by building this hall showing the most popular Canadian hockey players. From Front street, walk a few minutes and then take York street on the left. This street will take you to the symbol of Toronto: the CN Tower. 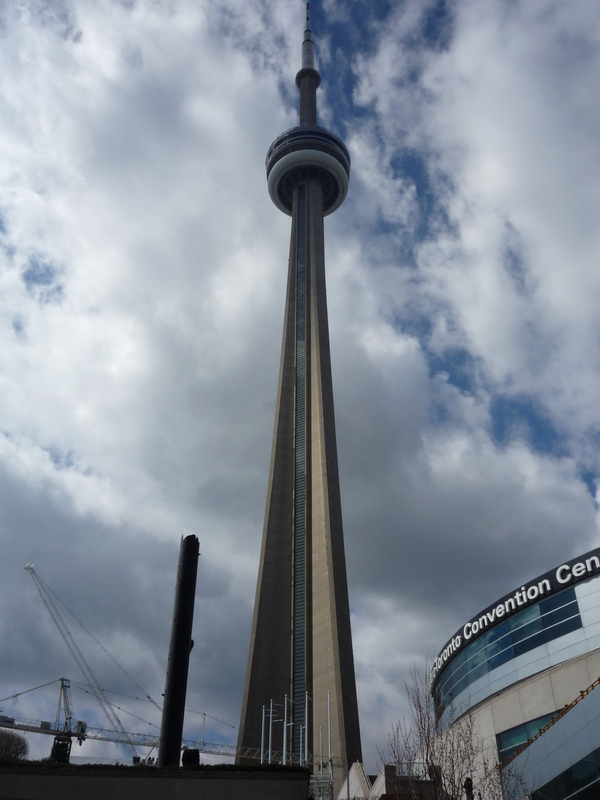 This tower is probably in 90% of Toronto’s pictures and Toronto’s postcards, it is a huge tower that can be visible from everywhere in the city. 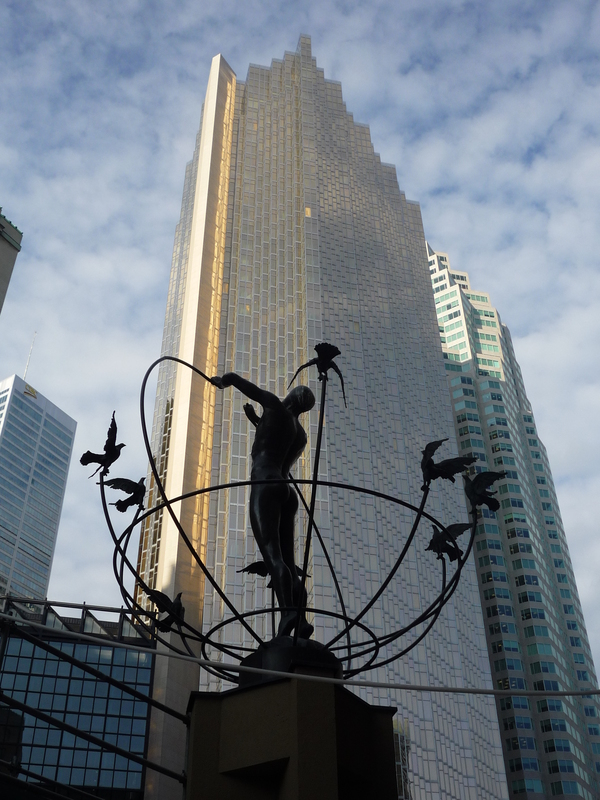 If you love admiring the skyscrapers, have a walk around the CN Tower and see the downtown area, some buildings are real masterpieces of contemporary architecture. From the CN Tower, you can easily reach the second part of the waterfront, this one almost done. Have a nice walk over there and see how the surrounding nature fuses with the contemporary architecture of the skyscrapers. If the first night you went out in Dundas Square, the second evening can be spent in the Old Distillery district and in one of its great clubs. And the trip to Toronto and Eastern Canada is unfortunately over. This trip has been probably one of the best I have ever had in my life, I enjoyed every single moment of it and while I’m writing about it I still feel those emotions. Reblogged this on Crazy PlanEat.